"Sharapova" redirects here. For other uses, see Sharapov (surname). This name uses Eastern Slavic naming customs; the patronymic is Yuryevna and the family name is Sharapova. Last updated on: 3 September 2018. Sharapova became the world No. 1 for the first time on August 22, 2005, at the age of 18, becoming the first Russian female tennis player to top the singles rankings, and last held the ranking for the fifth time for four weeks from June 11, 2012, to July 8, 2012. Her 36 singles titles and five Grand Slam titles—two at the French Open and one each at the Australian Open, Wimbledon, and US Open—rank third among active players, behind Serena and Venus Williams. She won the year-ending WTA Finals in her debut in 2004. She has also won three doubles titles. In March 2016, Sharapova revealed she had failed a drug test at the 2016 Australian Open on January 26, 2016. She had tested positive for meldonium, a substance that had been banned (effective January 1, 2016) by the World Anti-Doping Agency (WADA). On June 8, 2016, she was suspended from playing tennis for two years by the International Tennis Federation (ITF). On October 4, 2016, the suspension was reduced to 15 months, starting from the date of the failed test, as the Court of Arbitration for Sports found that she had committed "no significant fault" and that she had taken the substance "based on a doctor's recommendation ... with good faith belief that it was appropriate and compliant with the relevant rules". She returned to the WTA Tour on April 26, 2017 at the Porsche Tennis Grand Prix. Maria Sharapova was born on April 19, 1987, in Nyagan, Siberia, Russian SFSR. Her parents, Yuri and Yelena, are from Gomel, Belarussian SSR. Concerned about the regional effects of the 1986 Chernobyl nuclear accident, they left their homeland shortly before Maria was born. In 1989, when Sharapova was two, the family moved to Sochi, Krasnodar Krai, Russia. When she was 4, she hit the first tennis ball, and that's the thing she have a special place in her heart. There her father Yuri befriended Aleksandr Kafelnikov, whose son Yevgeny would go on to win two Grand Slam singles titles and become Russia's first world No. 1 ranked tennis player. Aleksandr gave Sharapova her first tennis racquet in 1991 when she was four, whereupon she began practicing regularly with her father at a local park. Maria took her first tennis lessons with veteran Russian coach Yuri Yutkin, who was instantly impressed when he saw her play, noting her "exceptional hand-eye coordination". In 1993, at the age of six, Sharapova attended a tennis clinic in Moscow run by Martina Navratilova, who recommended professional training at the IMG Academy in Bradenton, Florida, which had previously trained players such as Andre Agassi, Monica Seles, and Anna Kournikova. With money tight, Yuri Sharapov borrowed the sum that would enable him and his daughter, neither of whom could speak English, to travel to the United States of America, which they finally did in 1994. Visa restrictions prevented Sharapova's mother from joining them for two years. Arriving in Florida with savings of US$700, Sharapova's father took various low-paying jobs, including dishwashing, to fund her lessons until she was old enough to be admitted to the academy. Before she entered the IMG business, she trained with Rick Macci, in the Rick Macci Tennis Academy. She then was offered a deal from IMG which forced her to change academies. Originally, she did train with Rick Macci, but after the deal with IMG, she could not see Rick Macci anymore. In 1995, she was signed by IMG, who agreed to pay the annual tuition fee of $35,000 for Sharapova to stay at the Academy, allowing her to finally enroll at the age of 9. Sharapova first hit the tennis scene in November 2000, when she won the Eddie Herr International Junior Tennis Championships in the girls' 16 division at the age of just 13. She was then given a special distinction, the Rising Star Award, which is awarded only to players of exceptional promise. Sharapova made her professional debut in 2001 on her 14th birthday on April 19, and played her first WTA tournament at the Pacific Life Open in 2002, winning a match before losing to Monica Seles. Due to restrictions on how many professional events she could play, Sharapova went to hone her game in junior tournaments, where she reached the finals of the girls' singles events at the Australian Open and Wimbledon in 2002. She was the youngest girl ever to reach the final of the Australian Open junior championship at 14 years and 9 months. Sharapova reached No. 6 in the ITF junior world singles ranking on October 21, 2002. In all, she won three junior singles tournaments and was runner-up at five, including two junior Grand Slam events. Her win-loss record in junior competition was 47–9. Her best results in the Junior Grand Slam tournaments were the finals of the 2002 Australian Open, finals of the 2002 Wimbledon Championships, third round of the 2002 French Open, and second round of the 2001 US Open. From 2003, Sharapova played a full season and made a rapid climb into the top 50 by the end of the year. She made her debuts at both the Australian Open and the French Open, but failed to win a match in either. Then, as a wildcard at Wimbledon, she defeated 11th seed Jelena Dokić, her first win over a top-20 player, to reach the fourth round, where she lost in three sets to Svetlana Kuznetsova. By the end of September, Sharapova had already captured her first WTA title at a smaller event, the Japan Open Tennis Championships, before winning her second in her final tournament of the season, the Bell Challenge. To cap off her first full season as a professional, she was awarded the WTA Newcomer of the Year honor. Sharapova was defeated in the third round of the Australian Open by sixth seed Anastasia Myskina. She later reached the semifinals at the Cellular South Cup, where she lost to eventual champion Vera Zvonareva. During the spring clay-court season, Sharapova entered the top 20 on the WTA world rankings as a result of reaching the third round of the Qatar Telecom German Open and the Internazionali BNL d'Italia, both of which were Tier I events. At the latter event, she defeated a player ranked in the top 10 for the first time with a straight-sets win over world No. 10 and 2004 French Open finalist Elena Dementieva. Later that clay-court season, she went on to make the quarterfinals of a Grand Slam for the first time at the French Open, losing there to Paola Suárez. Sharapova won the third title of her career at the Wimbledon warm-up DFS Classic, defeating Tatiana Golovin in the final. Seeded 13th and aged 17 at Wimbledon, she reached her first Grand Slam semifinal by defeating Ai Sugiyama. There, she defeated fifth seed and former champion Lindsay Davenport. In the final, Sharapova upset top seed and defending champion Serena Williams to win her first Grand Slam singles title, and become the third-youngest woman to win the Wimbledon title, behind only Lottie Dod and Martina Hingis. Sharapova also became the second Russian woman (after Anastasia Myskina had won the year's previous major at Roland Garros) to win a Grand Slam singles title. The victory was hailed by the media as "the most stunning upset in memory", with other writers commenting on her arrival as a serious challenger to the Williams' dominance at Wimbledon. She entered the top 10 in the rankings for the first time as a result of the win. Following her Wimbledon win, attention and interest in Sharapova in the media greatly increased, a rise in popularity dubbed "Maria Mania." She won three of six matches in her preparations for the US Open. At the US Open itself, she reached the third round, before being eliminated by Mary Pierce. In order to regain confidence, Sharapova played and won consecutive titles in Asia in the fall, the Hansol Korea Open Tennis Championships and the Japan Open Tennis Championships. In October, Sharapova defeated Venus Williams en route to making the final of a Tier I event for the first time at the Zurich Open, losing in the final to Alicia Molik. She then made her debut at the year-ending WTA Tour Championships. There, she won two of her three round-robin matches (including a win over US Open champion Svetlana Kuznetsova) in order to advance to the semifinals, where she defeated Myskina. In the final, she defeated an injured Serena Williams, after trailing 4–0 in the final set. Sharapova started the year at the Australian Open, where she defeated fifth seed Svetlana Kuznetsova to reach the second Grand Slam semifinal of her career. Sharapova held match points in the third set of her semifinal match, before losing to eventual champion Serena Williams. In February, Sharapova won back-to-back tournaments, the Toray Pan Pacific Open and the Qatar Total Open, allowing her to reach number 3 in the world rankings for the first time. In the semifinals of the Tier I Pacific Life Open, Sharapova was defeated by Lindsay Davenport, the first time she had failed to win a game in a match. She defeated former world No. 1 players Justine Henin and Venus Williams to reach the final at the Tier I NASDAQ-100 Open, where she lost to Kim Clijsters. Sharapova made the semifinals of a clay-court tournament for the first time at the Italian Open, where she lost to Patty Schnyder. Sharapova would have become world No. 1 for the first time had she won the tournament. Sharapova then reached the quarterfinals of the French Open for the second consecutive year, before losing to eventual champion Henin. On grass, Sharapova won her third title of the year when she successfully defended her title at the DFS Classic, defeating Jelena Janković in the final. As the defending champion at Wimbledon, Sharapova reached the semifinals without dropping a set and losing a service game just once, extending her winning streak on grass to 24 matches. However, she was then beaten by eventual champion Venus Williams. Sharapova had far fewer points to defend, and so she became the first Russian woman to hold the world No. 1 ranking on August 22, 2005. Her reign lasted only one week, however, as Davenport reclaimed the top ranking after winning the Pilot Pen Tennis tournament. As the top seed at the US Open, Sharapova lost in the semifinals to Kim Clijsters, meaning she had lost to the eventual champion in every Grand Slam of the season. However, she once again leapfrogged Davenport to take the world No. 1 ranking on September 12, 2005. She retained it for six weeks, but after playing few tournaments while injured, she again relinquished the ranking to Davenport. To conclude the year, Sharapova failed to defend her title at the year-end Sony Ericsson Championships in Los Angeles, defeating Davenport in one of her round-robin matches, but ultimately losing in the semifinals to eventual champion Amélie Mauresmo. Sharapova started 2006 by losing in the semifinals of the Australian Open in three sets to Henin, also losing a rematch several weeks later at the Dubai Tennis Championships, having defeated former world No. 1 Martina Hingis and world No. 3 Lindsay Davenport in earlier rounds of the tournament. Sharapova claimed her first title in nine months at the Tier I tournament in Indian Wells, defeating Hingis in the semifinals and Elena Dementieva in the final. She reached the final in Miami before losing to Kuznetsova. Sharapova returned for the French Open. There, after saving match points in defeating Mashona Washington in the first round, she was eliminated by Dinara Safina in the fourth round. On grass, Sharapova was unsuccessful in her attempt to win in Birmingham for the third consecutive year, losing in the semifinals to Jamea Jackson. Despite that, she was among the title favorites at Wimbledon, where the eventual champion Mauresmo ended up beating her in the semifinals. Sharapova claimed her second title of the year at the Tier I Acura Classic, defeating Clijsters for the first time in the final. As the third seed at the US Open, Sharapova defeated top seed Mauresmo for the first time in the semifinals, and then followed up by beating second seed Justine Henin to win her second Grand Slam singles title. That autumn, Sharapova won titles in back-to-back weeks at the Zurich Open and the Generali Ladies Linz. By winning all three of her round-robin matches at the WTA Tour Championships, she extended her win streak to 19 matches, before it was snapped in the semifinals by eventual champion Henin. Sharapova would have finished the season as world No. 1 had she won the event. As it was, she finished ranked world No. 2, her best year-end finish yet. Sharapova was the top seed at the Australian Open due to top-ranked Justine Henin's withdrawal. After being two points away from defeat in the first round against Camille Pin, she went on to reach the final of the tournament for the first time, but was routed there by Serena Williams who was ranked world No. 81 at the time. After reaching the final, Sharapova recaptured the world No. 1 ranking. She held it for seven weeks, surrendering it back to Henin after failing to defend her title at the Pacific Life Open, instead losing in the fourth round to Vera Zvonareva after struggling with a hamstring injury. The following fortnight, she defeated Venus Williams in the third round of the Sony Ericsson Open, before being beaten again by Serena Williams. A shoulder injury forced Sharapova to miss most of the clay-court season for the second consecutive year, resulting in her only tune-up for the French Open being the İstanbul Cup, where she lost in the semifinals to Aravane Rezaï. She reached the semifinals of the French Open for the first time in her career, before losing to Ana Ivanovic. On grass, Sharapova was runner-up to Jelena Janković at the DFS Classic. Following that, she experienced her earliest Wimbledon loss since 2003 by losing in the fourth round to eventual champion Venus Williams. Sharapova clinched the US Open Series by defending her title at the Acura Classic, her only championship of the year, and reaching the semifinals in Los Angeles. In her US Open title defense, Sharapova was upset in her third-round match to 30th seed Agnieszka Radwańska, making it her earliest exit at a Grand Slam singles tournament since the 2004 US Open, where she lost in the same round. Following the US Open loss, Sharapova did not play again until the Kremlin Cup in October, where she lost her opening match to Victoria Azarenka. Shortly after this, she fell out of the top 5 in the world rankings for the first time since 2004. She qualified for the eight-woman year-end Sony Ericsson Championships because of a withdrawal by Venus Williams before the start of the tournament. Despite having not previously won a match in two months, Sharapova topped her round-robin group at the tournament, after winning all three of her matches, defeating Svetlana Kuznetsova, Ana Ivanovic, and Daniela Hantuchová. She then defeated Anna Chakvetadze in the semifinals. In the final, she lost to world No. 1 Henin in a match that lasted 3 hours and 24 minutes. Sharapova reached the top 5 again to end the year. Sharapova was seeded fifth at the Australian Open, but was not considered a favorite. Nevertheless, she defeated former world No. 1 Lindsay Davenport in the second round, and then world No. 1 Henin in the quarterfinals, ending the latter's 32-match winning streak. She proceeded to the finals by defeating Jelena Janković in the semifinals, and defeated Ana Ivanovic in the final to win her third Grand Slam title, having not dropped a set all tournament. After the Australian Open, Sharapova extended her winning streak to 18 matches. This run encompassed two wins including at the Tier I Qatar Total Open. Her winning streak was ended in the semifinals of the Pacific Life Open by Kuznetsova. In April, Sharapova won the Bausch & Lomb Championships, having survived her longest-ever match, at 3 hours and 26 minutes long, in the third round against Anabel Medina Garrigues. The following week, at the Family Circle Cup, she lost in the quarterfinals to Serena Williams, her fourth consecutive loss to the American. In May, Sharapova regained the world No. 1 ranking because of Henin's sudden retirement from professional tennis and request to the WTA that her own ranking be removed immediately. As the top-seeded player at the French Open, Sharapova was within two points of being knocked out by Evgeniya Rodina in the first round, before eventually winning. As a result of losing to eventual finalist Dinara Safina in the fourth round (after serving for the match), she relinquished her No. 1 ranking. Her dip in form continued at Wimbledon, where she lost in the second round to world No. 154 Alla Kudryavtseva. This was her earliest loss at Wimbledon, and at any Grand Slam in almost five years. Sharapova withdrew from the Rogers Cup tournament in August following a shoulder injury. An MRI scan revealed that she had been suffering from a rotator cuff tear since April, forcing her out of all tournaments for the rest of the season, including the Beijing Olympics, the US Open, and the WTA Tour Championships. In spite of that, she still finished the year ranked world No. 9. In October, after a failed attempt to rehabilitate the shoulder, Sharapova had surgery to repair the tear. Sharapova did not attempt to defend her Australian Open title, as she continued to recover from surgery. She returned to the sport in March, in the doubles tournament at the BNP Paribas Open, but she and partner Elena Vesnina lost in the first round. After this, Sharapova withdrew from further singles tournaments, resulting in her standing in the world rankings being severely affected. She dropped out of the top 100 for the first time in six years in May, the nadir being world No. 126. Playing her first singles tournament in nearly ten months, Sharapova made the quarterfinals of the clay-court Warsaw Open in May, losing to finalist Alona Bondarenko. The following week, in her first Grand Slam appearance since her surgery, she reached the quarterfinals of the French Open, before her run was ended by Dominika Cibulková. During the summer grass-court season, Sharapova played in Birmingham, losing in the semifinals to Li Na. Sharapova then played at Wimbledon as the 24th seed. She was upset in the second round by Gisela Dulko in three sets. Sharapova enjoyed considerable success in the summer months, reaching the quarterfinals at the Bank of the West Classic, the semifinals at the LA Women's Tennis Championships, and finishing runner-up at the Rogers Cup to Elena Dementieva. At the 2009 US Open, Sharapova was seeded 29th. She found her way into the third round, defeating Tsvetana Pironkova and Christina McHale all in straight sets. She was stunned in the third round by American teenager Melanie Oudin. It was the second time in Sharapova's career that she lost to a teenager at a Grand Slam, having lost to Agnieszka Radwańska during the same event in 2007. The loss made Sharapova's ranking go down to No. 32. The final stretch of the season brought Sharapova her first title of the year in Tokyo, after opponent Jelena Janković retired after being down 2–5 to Sharapova in the final. By virtue of that result, she was the recipient of a bye at the China Open, but failed to capitalize on it, losing to Peng Shuai in the third round. She ultimately finished the season at world No. 14, having improved from No. 126 when she started her comeback from injury. After playing two exhibition tournaments in Asia, Sharapova officially began her season at the Australian Open, where she was upset in her first-round match against Maria Kirilenko. The loss meant that for the first time since 2003, Sharapova had lost her opening match at a Grand Slam event. She then rebounded by winning a smaller American event, the Cellular South Cup, her 21st career WTA title and first of the year. At the BNP Paribas Open, Sharapova lost in the third round to Zheng Jie, aggravating a bruised bone on her right elbow in the process, which resulted in her eventual withdrawal from the Sony Ericsson Open and the Family Circle Cup. Returning at the 2010 Mutua Madrileña Madrid Open, Sharapova lost in the first round to Lucie Šafářová. She continued her French Open preparation at the Internationaux de Strasbourg as a wildcard, advancing to the final, where she beat Kristina Barrois. This was her first title on red clay and 22nd overall title. At the French Open, Sharapova's brief clay season culminated with a third-round loss to four-time champion Justine Henin. Sharapova began her preparations for Wimbledon at the Aegon Classic. She advanced to the final for the fourth time, where she lost to Li Na. As the 16th seed at Wimbledon, Sharapova lost in the fourth round to world No. 1 and eventual champion Serena Williams, despite having three set points in the opening set. The match was seen as another encouraging performance for Sharapova, with some stating their belief that she was approaching the form that would see her contending for Grand Slams once more, and Sharapova herself stating that she felt that she was "in a much better spot than I was last year." During the US Open Series, Sharapova made two straight finals, losing to Victoria Azarenka at the Bank of the West Classic, and to Kim Clijsters at the Western & Southern Financial Group Women's Open. In the latter match, Sharapova held three match points while leading 5–3 on Clijsters's serve late in the second set, but could not convert them. At the U.S. Open, Sharapova was the 14th seed. She made it to the fourth round, where she played top seed and 2009 finalist Caroline Wozniacki and lost. Sharapova's last two tournaments of the season ended in disappointment. She played in the Toray Pan Pacific Open in Tokyo, where she was upset in the first round by 39-year-old Kimiko Date-Krumm. Her last tournament of the year was the China Open, where she lost in the second round to fellow Russian Elena Vesnina. She ended the year at number 18 in the world. It was announced that Sharapova would bring in Thomas Högstedt as a coach for the 2011 season, joining Michael Joyce. On December 5, Sharapova won an exhibition match against world No. 2 Vera Zvonareva in Monterrey, Mexico. In Sharapova's first official Australian Open warm-up tournament at the 2011 ASB Classic in Auckland, New Zealand, she was seeded first. She lost to the Hungarian veteran and eventual champion Gréta Arn in the quarterfinals. After the ASB Classic, Sharapova decided to split up with Joyce, ending a successful cooperation that has brought her two Grand Slam victories and the world No. 1 ranking. Sharapova participated in the first Grand Slam of the season at the Australian Open, where she was the 14th seed, but lost to Andrea Petkovic in the fourth round. She also had to pull out of the 2011 Dubai Tennis Championships and 2011 Qatar Ladies Open because of an ear infection. Sharapova returned to the tour in March by taking part in the 2011 BNP Paribas Open, where she was seeded 16th. She defeated former world No. 1 Dinara Safina, in the fourth round en route to the semifinal, where she lost to world No. 1 Caroline Wozniacki. At the 2011 Sony Ericsson Open in Key Biscayne, Sharapova defeated 26th seed Alexandra Dulgheru in the quarterfinals, in a match lasting 3 hours and 28 minutes. In the semifinals, Sharapova took her Australian Open reprisal on Germany's Andrea Petkovic by defeating her. In the final, she was defeated by Victoria Azarenka, despite a late comeback in the second set. With this result, Sharapova returned to the top 10 for the first time since February 2009. 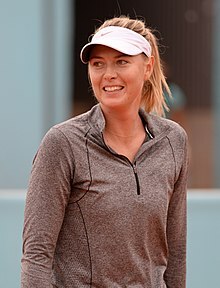 During the clay-court season, Sharapova participated in 2011 Mutua Madrileña Madrid Open, where she lost to Dominika Cibulková in the third round, and the 2011 Internazionali BNL d'Italia, where she was seeded seventh. She defeated top seed Caroline Wozniacki in the semifinals and sixth seed Samantha Stosur in the final to take home the title, marking her biggest clay-court victory to date. At the 2011 French Open, Sharapova was seeded seventh. She defeated French wildcard Caroline Garcia in the second round, despite trailing 3–6, 1–4, before winning the last 11 games of the match. In the quarterfinals, she defeated 15th seed Andrea Petkovic, marking her first Grand Slam semifinal since her comeback from the career-threatening shoulder injury. She then lost to sixth seed and eventual champion Li Na, in the semifinals, ending her clay season with a win-loss record of 12–2. At the 2011 Wimbledon Championships, Sharapova had not dropped a set entering the final, before losing to eighth seed Petra Kvitová in straight sets. This marked her first final in over three years at a Grand Slam event. Sharapova started her summer hard-court season at the 2011 Bank of the West Classic in Stanford, California. In a highly anticipated match, Sharapova lost to the eventual champion Serena Williams in the quarterfinals. In her next event at the 2011 Rogers Cup in Toronto, Ontario, Canada, Sharapova lost to Galina Voskoboeva in the third round, marking her 100th career loss. Sharapova then contested the 2011 Western & Southern Open in Cincinnati, Ohio. As the fourth seed, she received a bye into the second round. On the way to her fourth final of the year, she beat Anastasia Rodionova, 14th seed Svetlana Kuznetsova, tenth seed Samantha Stosur, and 2nd seed Vera Zvonareva. In the final, she defeated fellow former world No. 1 Jelena Janković, in 2 hours and 49 minutes, making it the longest WTA tour final of the year. She subsequently moved up to world No. 4, her highest ranking since August 2008 and the highest since her comeback from her shoulder injury. Sharapova entered the US Open, where she was seeded third. She beat Heather Watson, and Anastasiya Yakimova, to reach the third round. She was then upset by Flavia Pennetta. However, because of the fall of Kim Clijsters and Vera Zvonareva in the rankings, Sharapova climbed to world No. 2. Sharapova's next tournament was the 2011 Toray Pan Pacific Open in Tokyo, Japan. As second seed, she received a bye into the second round, where she beat Tamarine Tanasugarn. She then beat 13th seed Julia Görges, before retiring against Petra Kvitová in the quarterfinal, 3–4, after slipping on the baseline, suffering an ankle injury. This also forced her to withdraw from the 2011 China Open the following week. Sharapova then flew to Istanbul to prepare for the 2011 WTA Tour Championships, her first time qualifying since 2007. During the WTA Tour Championships, Sharapova withdrew during the round-robin stage after defeats against Samantha Stosur and Li Na, as a result of the ankle injury she had suffered in Tokyo. Sharapova ended the year as No. 4 in the world, her first top-10 finish since 2008 and first top-5 finish since 2007. Sharapova withdrew from the 2012 Brisbane International because of her ongoing ankle injury. Her first tournament of the season was the 2012 Australian Open, where she was seeded fourth. Sharapova advanced to the final round defeating Gisela Dulko, Jamie Hampton, and 30th seed Angelique Kerber, compatriot Ekaterina Makarova and world No. 2 Petra Kvitová. She lost to Victoria Azarenka in two sets. As a result, her ranking improved to world No. 3. She then played in the Paris, where she lost in the quarterfinals to eventual champion Angelique Kerber. As a result, her ranking improved to world No. 2. At the Indian Wells, after battling for over three hours, Sharapova defeated compatriot Maria Kirilenko to set up a semifinal meeting with Ana Ivanovic. Sharapova advanced to the final after Ivanovic retired due to a hip injury. In the final, she played world No. 1 Victoria Azarenka in a rematch of the Australian Open final, but lost again in straight sets. Sharapova's next tournament was the 2012 Sony Ericsson Open, where she was seeded 2nd and received a bye. In the final, Sharapova lost in straight sets to fifth seed Agnieszka Radwańska. This was her third loss of the year in finals out of four tournaments played so far. In the Porsche Tennis Grand Prix in Stuttgart, Sharapova was seeded second. She had a bye in the first round, and advanced to the third round after Alizé Cornet retired in the second set. She won her first title of the year in Stuttgart after defeating world number one Victoria Azarenka. In doing so, Sharapova defeated three current Grand Slam title holders to win the tournament. Sharapova then played on the 2012 Mutua Madrid Open, a premier mandatory event. In the third round, Sharapova's opponent Lucie Šafářová was unable to compete and withdrew from the tournament, earning Sharapova a walkover into the quarterfinals. She was then beaten by eventual champion Serena Williams in straight sets. As the defending champion and second seed at the Italian Open, Sharapova had a bye in the first round. In the semifinals, Sharapova defeated Angelique Kerber to advance to the final for the second year in a row. In the final, Sharapova saved match point for a 2-hour 52-minute win over Li Na for her 26th career title. This marked the fourth time Sharapova had successfully defended a title. Sharapova was seeded second at the French Open, where she defeated Alexandra Cadanțu, Petra Kvitová on her way to the finals, allowing her to regain the world No. 1 ranking. In the final, she defeated Sara Errani for her first French Open title. Sharapova became only the tenth woman to complete a Career Grand Slam with the French Open victory. During the tournament, Sharapova was also asked by the Russian Olympic Committee to carry the Russian flag in the Olympic Games, making her the first female flag bearer for Russia in Olympic history. Sharapova then extended her win streak to 15 matches when she competed in the Wimbledon Championships as the top seed there for the first time in her career. However, she was upset in the fourth round by 15th-seeded Sabine Lisicki, whom she beat in the previous year's semifinals. As a result, she lost her No. 1 ranking to Victoria Azarenka. She played in the 2012 Summer Olympic Games in London, her first Olympics. In the quarterfinals, Sharapova defeated fellow former No. 1 Kim Clijsters to advance to the semifinals, where she faced her compatriot, Maria Kirilenko. Sharapova defeated Kirilenko to reach the Olympic final, where she lost to Serena Williams, marking her worst defeat by the American. With this performance, Sharapova overtook Agnieszka Radwańska as world No. 2. Sharapova was seeded third at the US Open, but had no hard-court tune-ups after the Olympics due to a stomach virus. In the fourth round, Nadia Petrova took it to a third set and was winning until a rain delay. After the delay, Sharapova came back to win. In the quarterfinals, she faced Marion Bartoli, who was 4–0 up before a rain delay, which delayed the match a whole day. Sharapova then came back from a set down to win. In the semifinals, Sharapova lost to world No. 1 Victoria Azarenka. Sharapova's next tournament was the Toray Pan Pacific Open in Tokyo. She made it to the quarterfinals, losing to Samantha Stosur. At the China Open she was seeded second. In the finals she was again defeated by Azarenka. Sharapova's next tournament was the year-end championships in Istanbul, where she was seeded second. She defeated Sara Errani, Agnieszka Radwańska, and Samantha Stosur in the round-robin matches. In the semifinals, Sharapova beat Azarenka, bringing their head-to-head meetings to 7–5 in Azarenka's favour. Although Sharapova made it to the final, Azarenka clinched the year-end No. 1 ranking with her two round-robin wins. She lost to Serena Williams for the 13th consecutive time in the final. Sharapova's first scheduled tournament of the 2013 season was the Brisbane International, where she was seeded second. However, she withdrew from the tournament before it began, citing a collarbone injury. She started her season at the Australian Open seeded second. She defeated Olga Puchkova and Misaki Doi in the first two rounds without losing a game in either match, the first time a player has won in back-to-back double bagels at a Grand Slam tournament since the 1985 Australian Open. Sharapova then defeated Venus Williams, Kirsten Flipkens, and Ekaterina Makarova, where in losing only nine games, she broke Monica Seles' record of fewest games dropped heading into a Grand Slam semifinal. She lost to Li Na in the semifinals. She reached the semifinals at the Qatar Total Open, losing to Serena Williams for the 10th straight time in her career. Her next tournament was Indian Wells, where she was seeded second. She received a bye into the second round and successfully reached the final without dropping a set, where she faced 2011 Indian wells champion and former world No. 1 Caroline Wozniacki. After an hour and twenty-one minutes, Sharapova won the tournament. This was Maria's 28th career title and second at Indian Wells. Her win also made her the No. 2 player in the world behind Serena Williams. Maria then competed at the Sony Open. Once again she reached the final without dropping a set and faced world No. 1 Serena Williams. Maria started the match strong, winning the first set. However, Serena won the second and dominated the third set. This was Maria's 11th consecutive loss against Serena. Next, she played at the indoor clay event in Stuttgart, where she was the defending champion. Maria was top seed and had a bye in the first round. Her first three matches were long three-setters: she first beat world No. 25 Lucie Šafářová, dropping the second set on a tiebreak, then Ana Ivanovic, then in the semifinals, she won against third seed Angelique Kerber. In the final, in what was her ninth victory against the Chinese out of 14 matches, she beat second seed world No. 5 Li Na in straight sets to win her 29th career title. A week later, she competed at the Madrid Open, reaching the final, again without dropping a set. She faced Serena Williams for the 15th time, losing for the 12th consecutive time in straight sets. Next, she played in Rome, where she was seeded second and had a bye in the first round. She beat 16th seed Sloane Stephens in straight sets (with the loss of just three games) in the third round, but then did not play her quarterfinal match against seventh seed Sara Errani and retired from the tournament due to a viral illness. At the 2013 French Open, Sharapova reached the final again, beating Azarenka in three sets in the semifinals, but there she lost in straight sets to Serena Williams. At Wimbledon she was comprehensively beaten in the second round by qualifier Michelle Larcher de Brito. Sharapova then returned to the tour at the 2013 Western & Southern Open, where she lost her opening match to Sloane Stephens in three sets. A week later Sharapova withdrew from the U.S. Open, citing a shoulder injury, which prematurely ended her season. Sharapova had not played since August 2013 due to a recurring shoulder injury and made her comeback at the 2014 Brisbane International. Sharapova advanced to the semi-finals where she was beaten in straight sets by Serena Williams. At the 2014 Australian Open Sharapova, ranked 3rd, was knocked out of the tournament in the 4th round by the 20th seed, and eventual finalist, Dominika Cibulková. Sharapova lost the match in 3 sets. Sharapova then participated in GDF Suez where she was upset in the semifinals to fellow Russian and eventual tournament winner Anastasia Pavlyuchenkova in three sets. In March, playing in the Indian Wells Masters, she was beaten by 22-year-old Italian Camila Giorgi in the third round, in three sets. Therefore, due to the WTA ranking system, this would mean another drop in ranking, bringing her to world No. 7. In April, she won Stuttgart Open, her first title of the year and 30th of her career by defeating Ana Ivanovic in three sets. Stuttgart is the only tournament Sharapova has won three times. In May, Maria won the Madrid Open, her second title of the year and first in Madrid, defeating Simona Halep in three sets. With nine clay titles, she joins Venus Williams as the third most successful active player on the surface. Sharapova then competed in the Italian Open in Rome, where she made the third round. She lost to Ana Ivanovic in straight sets. Sharapova was seeded 7th at 2014 French Open and defeated Ksenia Pervak, Tsvetana Pironkova, and Paula Ormaechea in the first 3 rounds, all in straight sets. In the fourth round she defeated Samantha Stosur, reeling off nine straight games from a set and 3–4 down. This marked her 14th win in 16 meetings with the Australian. In the quarters, she defeated Garbiñe Muguruza, again coming back from a set down, to reach the semifinals at the French for the fourth consecutive year. In the semi-finals, she defeated Eugenie Bouchard, once again coming back from a set down, to reach her third consecutive French Open final. In the final, she defeated Simona Halep in three sets to win her second French Open title and fifth overall Major title. This was the first time since 2001 where a third set was contested in the final. The match took just over three hours, and has been described as one of the best women's finals in recent years. The 2014 Wimbledon Championships would be her next tournament, as Sharapova chose not to play a warm-up event before the third Grand Slam of the season gets underway. At the 2014 Wimbledon Championships, Sharapova reached the fourth round, where she lost to German Angelique Kerber, the ninth seed, in three sets. Sharapova then played the 2014 Rogers Cup in Montreal where she was the 4th seed. She received a first round bye and faced Garbiñe Muguruza in her opener, she won in 3 sets. In the following round she lost in 3 sets to Muguruza's compatriot, Carla Suárez Navarro. At the 2014 Western & Southern Open, Sharapova was seeded 5th and defeated Madison Keys after having a first round bye. She then went on to defeat Pavlyuchenkova and newly crowned world No. 2 Simona Halep to reach the last four. She faced Ivanovic again but lost in a roller coaster three-setter despite having two match points. Sharapova then travelled to New York for the US Open where she was the 5th seed. She defeated compatriot Maria Kirilenko and Romanian Alexandra Dulgheru before overcoming 26th seeded German Sabine Lisicki in round 3 to set up a clash with Caroline Wozniacki in the round of 16. Sharapova lost to the Dane in 3 sets. Sharapova next played the inaugural 2014 Wuhan open where she was seeded 4th. After receiving a first round bye, she defeated compatriot Svetlana Kuznetsova in 3 sets and next faced Timea Bacsinszky. Although Sharapova won their 2 previous encounters, she was stunned by Timea in 2 tight sets, thus ending her campaign at the premier 5 tournament. The following week, Sharapova played the China Open in Beijing, a Premier Mandatory-level tournament. Reaching the final without dropping a set, Sharapova defeated world No. 9 Ana Ivanovic in the semis. In the final, Sharapova met reigning Wimbledon champion and world No. 3 Petra Kvitová. Sharapova won the match in 2 hours 30 minutes, defeating the Czech in three sets. By virtue of the win, Sharapova's ranking rose from No. 4 to No. 2 in the world and she secured herself the second seeding for the WTA year-end Championship. Also, Sharapova closed in on the year-end number-one ranking spot, being just 467 points behind Williams. Maria was ranked No. 2 heading into the WTA Tour Championships, with a chance of overtaking Serena Williams as world No. 1. She was drawn in the white group, with Petra Kvitová, Agnieszka Radwańska and Caroline Wozniacki. Her first match was a three set loss to Wozniacki. Maria also lost her 2nd round robin match to Kvitová in straight sets; her first loss to Petra since 2011. Maria still had a chance of making the Semis, but she needed to beat Radwańska in two sets, and Wozniacki needed to beat Petra in straight sets as well. She ended her year with a win against Radwańska in three sets, finishing 3rd overall in the White group. She ended the year as world No. 2, behind Serena Williams. Sharapova kicked off her 2015 season at the Brisbane International where she was top seed and received a bye in the first round. Sharapova defeated Yaroslava Shvedova and Carla Suárez Navarro. In the semi finals, Sharapova faced Elina Svitolina, beating her in straight sets. Reaching the final without dropping a set, Sharapova played an intense match against second seed Ana Ivanovic but came through in three sets. This was Sharapova's 10th win over Ivanovic and by winning her 34th title, it meant that Sharapova has won at least one title every year for 13 consecutive years. Also, it was just her second title in Australia so far, and for both she beat Ivanovic. Sharapova's next tournament was the 2015 Australian Open, where she beat Petra Martić and fellow countrywoman Alexandra Panova (despite having two match points against her) in the first two rounds, before beating Zarina Diyas and Peng Shuai in straight sets. There, she beat seventh-seeded Eugenie Bouchard and fellow Russian Ekaterina Makarova in straight sets to make her fourth Australian Open final, where she lost to Serena Williams in straight sets, worsening her record against her to 2–17. In February, following her participation in the Fed Cup, Sharapova played in Acapulco, where she beat Shelby Rogers, Mariana Duque Mariño and Magdaléna Rybáriková to advance the semifinals. Sharapova later withdrew from her match against Caroline Garcia, citing a stomach virus. Next, in Indian Wells, she beat Yanina Wickmayer and Victoria Azarenka in straight sets, before losing to defending champion Flavia Pennetta in the fourth round in three sets. After receiving a bye in the first round of the Miami Open, Sharapova lost in the second round to fellow Russian Daria Gavrilova in straight sets, marking her earliest exit from the tournament since her first appearance in Miami in 2003. Sharapova began her clay season in Stuttgart where she was the three-time defending champion. After receiving a first-round bye, she lost in the second round to Angelique Kerber in three sets, snapping Sharapova's win streak at the tournament and marking her first-ever loss at the tournament, having won it three times in a row (2012, 2013, & 2014). The loss also snapped a 64 match win streak on clay where Sharapova won the first set and went on to win the match. The last time Sharapova lost a match on clay after winning the first set was against Dinara Safina in the fourth round at the 2008 French Open. As a result of the loss Sharapova lost the No. 2 ranking to Simona Halep. Sharapova's next clay court tournament was the Madrid Open where she was the defending champion. She advanced to the semifinals. There, she was beaten by Svetlana Kuznetsova for the first time since 2008. Sharapova's next tournament was the Italian Open in Rome where she was seeded 3rd. She beat Victoria Azarenka in the quarterfinals in straight sets to set up a re-match with Daria Gavrilova. She beat Gavrilova in straight sets to advance to the final, where she faced Carla Suárez Navarro. After losing the first set, Sharapova managed to claim the next two sets and her third Rome title. By winning Rome, Sharapova reclaimed the No. 2 ranking over Halep, until August 24, when Halep went again to world No. 2, due to Sharapova's not playing any match after Wimbledon (where she reached the semifinals but lost to Serena), including US Open, due to injuries. She then received a wildcard into Wuhan Open and received a bye into the 2nd round. However, she retired in her match against Barbora Strýcová in the 3rd set, citing a left forearm injury. She then withdrew from the China Open, where she was the defending champion, to recover in time for the WTA Finals and the Fed Cup final. At the WTA Finals, she was drawn into the red group, alongside Simona Halep, Agnieszka Radwańska and Flavia Pennetta. She then won all three of her round-robin matches, and achieved 1st position in her group. Her win over Pennetta also marked the last match of the Italian's career. Sharapova then played the player who finished 2nd in the White Group, Petra Kvitová. She lost the match in straight sets, despite having a 5–1 lead in the second set. Sharapova then played in the Fed Cup final, winning both of her matches, against Karolína Plíšková and got revenge against Petra Kvitová for her loss in the WTA Finals. However, Russia eventually lost 2–3 after falling in a crucial doubles rubber. The Russian ended the season as being the world No. 4, despite not playing the US Open Series and missing most of the Fall Asian Hardcourt season. She had a win-loss record of 39–9 and won 2 titles, reaching the second week in all of the Grand Slams she played. Sharapova began her 2016 season at the Brisbane International where she was the defending champion. She would have faced Ekaterina Makarova in the 1st round, but withdrew hours before the match, citing a left forearm injury, and was replaced by Margarita Gasparyan. Due to Agnieszka Radwańska winning the Shenzhen Open, Sharapova was seeded fifth at the Australian Open. She was drawn to face Nao Hibino in the first round and won in straight sets. She then won her second round match against Aliaksandra Sasnovich, also in straight sets. Sharapova then lost her first set in the tournament as she defeated Lauren Davis in three sets. In the fourth round, she then played her first career match against Belinda Bencic and won in two tight sets over two hours of play. Sharapova then faced her long-time rival Serena Williams in the quarterfinal, a repeat of the previous year's final. Although she started the match brightly, she was defeated in straight sets. She failed to defend her finalist points from the previous year, and fell to sixth in the rankings after the tournament. After the Australian Open, Sharapova was nominated by team captain Anastasia Myskina to play the Fed Cup, but she had a forearm injury and was only listed for the doubles match. Russia lost the first three matches and chose Makarova to replace Sharapova for the dead doubles match. In the end, Russia lost 3–1 but by being nominated for the match, Sharapova successfully qualified for the Summer Olympics having played sufficient Fed Cup matches to meet the criteria. Citing the left forearm injury sustained at the start of the year, Sharapova withdrew from the Qatar Open, and a week before the BNP Paribas Open, she withdrew from that for the same reason. Following a failed drug test from the 2016 Australian Open, in which she tested positive for meldonium, a substance that had been banned, effective January 1, 2016 by the World Anti-Doping Agency (WADA), Sharapova was provisionally suspended from competitive tennis with effect from March 12. On June 8 she was banned for two years by the International Tennis Federation. Russian sports minister Vitaly Mutko has implied that Sharapova was targeted due to the political crisis in Russian-American relations. In October 2016, Sharapova's ban was reduced from 24 months (2 years) to 15 months, starting from January 26, 2016, the date of the drug test she had failed. Sharapova returned to the WTA tour in April 2017. She was given wild cards to compete in the following three WTA tournaments: Women's Stuttgart Open, Madrid Open and Italian Open. She played her first match of her comeback on April 26 at the Porsche Tennis Grand Prix, a tournament that she had previously won on three occasions. Her first round opponent was Italian Roberta Vinci, who she went on to defeat in straight sets to advance to the second round, making it her first victory since her return. In her on-court interview Sharapova said, "The first few seconds before you enter the arena – it's been a stage of mine since I was a young girl – I've been waiting for this moment for a long time." She followed it up with another straight sets victory over countrywoman Ekaterina Makarova in the second round. In the quarterfinals, she defeated qualifier Anett Kontaveit in straight sets, before losing to Kristina Mladenovic in the semifinals. Sharapova then took part in the 2017 Mutua Madrid Open where she beat Mirjana Lučić-Baroni in three sets. Sharapova played a second round encounter with Eugenie Bouchard which after three sets Sharapova lost. In the 2017 Internazionali BNL d'Italia opening match she defeated Christina McHale in straight sets. In her next match, she again faced the 16th seed Mirjana Lučić-Baroni in a rematch of their encounter in Madrid. At one set apiece, Sharapova needed a medical timeout for her thigh, which ultimately forced her to retire in the third set. Just before the players came on court, French Federation president Bernard Giudicelli announced that Sharapova would not be receiving a wildcard in the main draw or the qualifying draw, preventing her from playing in the 2017 French Open. Sharapova then received a wildcard to play Birmingham Classic. However, the same thigh injury at the Italian Open forced her to withdraw from the entire grass season, including the Wimbledon qualifying rounds. Sharapova was given another wildcard at the Stanford Classic, her first hard court tournament since the 2016 Australian Open. Her first round opponent was Jennifer Brady, whom she defeated in three sets. The win also pushed Sharapova back inside the top 150. Sharapova withdrew from the next round with a left arm injury. She was set to make a return at the Canadian Open, where she had received a wildcard, but ultimately withdraw due to a left arm injury. She was set to play the Cincinnati Open as a wildcard but pulled out to be fully fit for the US Open, which had also granted Sharapova a wildcard entry. She opened the US Open against world No. 2 Simona Halep, and won in three sets, her first US Open win since the 2014 US Open. In second round she defeated Tímea Babos, coming from a set down to win in three. In the third round, she played the American wildcard Sofia Kenin, an 18-year-old who was making her first main draw appearance in a major. Sharapova defeated the teenager in tight straight sets to advance to the second week of the US Open. She was defeated by 16th seed Anastasija Sevastova from Latvia in the fourth round. Sharapova received and accepted wildcards to enter the China Open and Tianjin Open, both held in China. In her opening match at the China Open, Sharapova once again faced Sevastova, this time prevailing in a three-hour, three-set match. In the second round, Sharapova defeated Ekaterina Makarova, seeing her move back into the top 100 for the first time since before her suspension. In the third round, Sharapova lost to Simona Halep in straight sets, marking her first loss to the Romanian after seven consecutive victories. Sharapova then remained in China for the Tianjin Open, which was her first appearance at the tournament. Sharapova went on to win the tournament, marking her first WTA title since 2015, without dropping a set, including coming back from 1–4 down in the first set and 1–5 down in the second set against 19-year-old Aryna Sabalenka in the final. The result saw her eventually climb the rankings into the top 60, and she later received another wildcard to enter the 2017 Kremlin Cup. Sharapova recorded her first opening round loss since 2013, with a straight-sets loss to eighth seed Magdaléna Rybáriková. Sharapova began her 2018 season at the Shenzhen Open. She defeated Mihaela Buzarnescu, Alison Riske and Zarina Diyas to advance to the semifinals, where she fell to defending champion Katerina Siniakova. Sharapova then returned to the Australian Open for the first time since her suspension, defeating Tatjana Maria and Anastasija Sevastova in the opening two rounds, before losing to Angelique Kerber in straight sets in the third round. Sharapova received a wildcard to enter the Qatar Open, losing in three sets to Monica Niculescu in the opening round. Sharapova pulled out of the Dubai Tennis Championships due to citing a forearm strain. Sharapova played the Indian Wells Open falling in the opening round to Naomi Osaka in straight sets. Sharapova was set to play the Miami Open but withdrew due to a forearm injury. Sharapova started her clay court season at the Porsche Tennis Grand Prix. Sharapova faced sixth seed Caroline Garcia in the opening round but lost in three tight sets. This was her fourth consecutive loss, marking her fall out of the top 50. Sharapova ended her losing streak with a straight sets win over Mihaela Buzărnescu at the Madrid Open. Sharapova defeated Irina-Camelia Begu, and Kristina Mladenovic in straight sets to advance to quarterfinals. Sharapova fell to Kiki Bertens in three sets, despite the loss, she climbed back inside the top 40. Sharapova began her Italian Open campaign with a three set win over 16th seed Ashleigh Barty. In the second round, Sharapova defeated Dominika Cibulková in three sets, following it up with a straight sets victory over Daria Gavrilova in the third round. From a set down, she went on to defeat world No. 5 Jelena Ostapenko in the quarterfinals. Despite taking the opening set in the semifinals, Sharapova's run in Rome ended with a three set loss to world No. 1 Simona Halep. Despite the loss, her performance improved her ranking inside the top 30 and being seeded for the first time since her suspension at the 2016 Australian Open. Sharapova began her 2018 French Open campaign with a three set win over Richèl Hogenkamp and continued with a straight sets win over Croatia's Donna Vekic in the second round. In the third round, she defeated world No. 6 Karolína Plíšková in straight sets to advance to the second week of the French Open. In the fourth round, Sharapova was set to play Serena Williams, but Williams withdrew due to injury, giving Sharapova a walkover into her first Grand Slam quarterfinal since the 2016 Australian Open. Sharapova's run ended with a straight sets loss to world No. 3 Garbiñe Muguruza in the quarterfinals. Sharapova was set to play the Birmingham Classic but withdrew to fully recover ahead of Wimbledon. Sharapova played two exhibition matches, losing her debut to Greece's Maria Sakkari but defeating Natalia Vikhlyantseva. Sharapova exited Wimbledon with a three set lost to Vitalia Diatchenko despite being up a set and serving for the match. This marked her worst Grand Slam result since the 2010 Australian Open and her first ever opening round loss at Wimbledon. Sharapova was set to play at the Silicon Valley Classic but withdrew due to a change in her schedule. Sharapova played at the Rogers Cup and recorded straight sets wins over Sesil Karatantcheva and Daria Kasatkina. Sharapova fell in the third round with a straight sets loss to World No.6 Caroline Garcia. Sharapova was set to play at the Western & Southern Open but withdrew before the tournament started. Sharapova began her US Open campaign in the opening round, with a straight set win over Patty Schnyder. Sharapova continued her run with straight set wins over Sorana Cîrstea and Jelena Ostapenko. In the fourth round, Sharapova's run ended with a straight sets loss to Carla Suárez Navarro. This marked the first time Sharapova had lost in the night session at Arthur Ashe Stadium, previously having a 22-0 record. Sharapova ended her season with withdraws at the China Open, Tianjin Open and Kremlin Cup with a right shoulder injury. Sharapova ended the season inside the top 30, ranked 29. Sharapova began her 2019 season at the Shenzhen Open. In the opening round, she defeated Timea Bacsinszky in straight sets which was also her 800th career singles match. In the second round, Sharapova defeated Wang Xinyu after Wang retired in the second set. In the quarterfinals, Sharapova lost to Aryna Sabalenka after she retired in the second set. Sharapova started her Australian Open campaign without the loss of a game in a win over Harriet Dart. Sharapova followed up with a straight set win over Rebecca Peterson and a three set victory over defending champion Caroline Wozniacki. Sharapova's run ended with a three set loss to Ashleigh Barty in the fourth round. Sharapova recorded her first win in Russia in thirteen years with a straight sets win over Daria Gavrilova at the 2019 St. Petersburg Ladies' Trophy. Sharapova withdrew in the second round where she was set to play Daria Kasatkina. Sharapova was set to play at the Indian Wells Open and Miami Open but withdrew before the tournaments started due to a shoulder injury for which she stated she was to receive a small surgery. Sharapova later withdrew from the Porsche Tennis Grand Prix and Madrid Open due to not being able to compete at her highest level. I received a letter from the ITF that I failed a drugs test at the Australian Open. I take full responsibility for it. For the past ten years I have been given a medicine called mildronate by my family doctor and a few days ago after I received the ITF letter I found out that it also has another name of meldonium which I did not know. It is very important for you to understand that for ten years this medicine was not on WADA's banned list and I had legally been taking the medicine for the past ten years. But on January 1st  the rules had changed and meldonium became a prohibited substance which I had not known. I was given this medicine by my doctor for several health issues that I was having in 2006. Meldonium is not approved for use in the United States, Sharapova's country of residence; however, it is legal to use in Russia, the country that Sharapova represents in tennis. The drug's inventor Ivars Kalviņš said that he did not think taking it should be construed as "doping", but he also said that it "is very popular among athletes" and was used by the Soviet military for "optimizing the use of oxygen" and that it "allows athletes to train under maximum strain". Don Catlin, a long-time anti-doping expert and the scientific director of the Banned Substances Control Group (BSCG) stated that "There's really no evidence that there's any performance enhancement from meldonium – Zero percent." That's a distortion of the actual "communications" which were provided or simply posted onto a webpage. I make no excuses for not knowing about the ban. The other "communications"? They were buried in newsletters, websites, or handouts (many of them technical, in small print). I didn't take the medicine every day. I took it the way my doctor recommended I take it and I took it in the low doses recommended. I'm proud of how I have played the game. I have been honest and upfront. I won't pretend to be injured so I can hide the truth about my testing. Most fellow tennis players reacted to Sharapova's announcement with little support or sympathy. John McEnroe and Pat Cash said they found it hard to believe her. Jennifer Capriati posted on Twitter that she should be stripped of her 35 professional titles. Chris Evert expressed her surprise at the lack of support in tennis for Sharapova, noting that she "[had] always isolated herself from the rest of the tennis world, from the players". Serena Williams expressed surprise at Sharapova's announcement but commended her for being "upfront with what she had done". Roger Federer, Rafael Nadal and Andy Murray all publicly condemned Sharapova and argued that she deserved to be punished on the basis that she failed the doping test, with Murray adding that "Taking a drug you don't necessarily need because it's legal is wrong" and Federer stating that "Whether it's intentional or not, I don't see too much difference. You must be 100 percent about what you are taking". Sharapova's case prompted Federer to urge the tennis federation to conduct more anti-doping tests. Novak Djokovic said that he felt sorry for her, but that she must still be ready for punishment. The Russian Tennis Federation strongly defended Sharapova, describing the positive drug test as "nonsense" and adding that they expected Sharapova to be available for the 2016 Olympic Games. As a result of the failed drug test, Nike and TAG Heuer suspended their relationships with Sharapova, while Porsche postponed promotional work. Racquet manufacturer HEAD stood by Sharapova, saying, "We look forward to working with her", and announced that they intended to extend their contract. They also suggested that WADA should prove scientifically why the drug should be banned. The United Nations Development Programme suspended Sharapova from her role as a goodwill ambassador on March 16, while expressing thanks for her support of their work over the previous nine years. On April 12, WADA intimated that athletes who tested positive for meldonium before March 1 could avoid bans, but the International Tennis Federation said that Sharapova's case would proceed. On June 8, the ITF announced that Sharapova would be suspended for two years. Sharapova indicated she would appeal the ban. Following a hearing on 7 and 8 September 2016, the Court of Arbitration for Sport (CAS) panel found that Sharapova had a reduced perception of the risk that she took while using Mildronate, because (a) she had used Mildronate for around ten years without any anti-doping issue, (b) she had consulted the Russian doctor who prescribed the Mildronate for medical reasons, not to enhance her performance, and (c) she had received no specific warning about the change in status of meldonium from WADA, the ITF, or the WTA. However, the CAS panel also noted Sharapova's failure to disclose her use of meldonium on her doping control forms and that she was at fault for (a) failing to give her agent adequate instructions as to how to carry out the important task of checking the Prohibited List, and (b) failing to supervise and control the actions of her agent in carrying out that task (specifically the lack of any procedure for reporting or follow-up verification to make sure that her agent had actually discharged his duty). Ms. Sharapova committed an anti-doping rule violation and that while it was with "no significant fault", she bore some degree of fault, for which a sanction of 15 months is appropriate. Sharapova has lived in the United States since moving there at the age of seven, but retains her Russian citizenship, and is therefore eligible to play in the Fed Cup for Russia. However, the behavior of Sharapova's father during her matches on the WTA Tour, combined with a perceived lack of commitment by her to the Fed Cup, has made her selection for the Russian Fed Cup team controversial in the past. After Sharapova had beaten fellow Russian Anastasia Myskina at the 2004 WTA Tour Championships, Myskina criticized Sharapova's father, saying: "He was just yelling and screaming instructions to her and I thought he just might jump right on the court at one point in the match." At the Fed Cup semifinals two weeks later, Myskina stated she would stop playing for Russia if Sharapova joined the Russian team the following season: "If she joins our team next season you won't see me there for sure. His behaviour is totally incorrect, simply rude. I don't want to be around people like him." Larisa Neiland, assistant to Russia Fed Cup captain Shamil Tarpishchev, added: "Her father's behaviour (at the WTA Tour Championships) was simply outrageous. I just don't see how he could work with the rest of us." However, Tarpishchev himself played down the problem, insisting: "I feel that things will calm down soon and we'll have Myskina, Sharapova, Kuznetsova and everyone else playing for Russia." At the end of 2005, Sharapova stated she was now keen to make her Fed Cup debut and was set to play against Belgium in April 2006, but withdrew. She later withdrew from ties against Spain in April 2007 and against the United States in July 2007 because of injuries. The latter withdrawal led to Russia's captain saying she would be "ineligible for selection" for the Fed Cup final in September. However, Sharapova attended the final, cheering from the sidelines and acting as a "hitting partner" in practices, resulting in some of her Russian teammates implying that she was attending only to enable her to play at the 2008 Beijing Olympics (rules state that players must have "shown commitment" to Fed Cup in order to play). Svetlana Kuznetsova said, "She said she wanted to be our practice partner but if you can't play how then can you practice?" Sharapova finally made her Fed Cup debut in February 2008, in Russia's quarterfinal tie against Israel. She won both her singles rubbers, against Tzipora Obziler and Shahar Pe'er, helping Russia to a 4–1 victory. For the semifinals, she was given permission to skip the tie, with Tarpishchev announcing that she will be on the team for the final. However, the date of the final coincided with the lay-off from her shoulder injury, and thus she did not play. In the 2011 first-round tie, Sharapova played Virginie Razzano of France and lost. Sharapova was supposed to play Alizé Cornet but she was suffering from a viral illness. Teammate Anastasia Pavlyuchenkova played and defeated Cornet to secure the 3–2 win for Russia against France. Sharapova continued to participate in 2012 and helped Russia to a 3–2 win against Spain in the first-round tie. Sharapova defeated Silvia Soler Espinosa in the first rubber, but was unable to play her second rubber due to illness. In 2015, Sharapova helped Russia earn a place in the semifinals after beating Pole Urszula Radwańska in the first tie and her sister Agnieszka Radwańska in the second tie. Sharapova was scheduled to play the semi-final against Germany, however, she withdrew days before the competition. She then joined the team for the final against Czech Republic and won both of her matches, against Petra Kvitová and Karolína Plíšková. Despite the 2 wins by Sharapova, Russia still lost 3–2 after losing the decisive doubles rubber. Sharapova is an aggressive baseliner with power, depth, and angles on her forehand and backhand. She is one of the few players on the WTA tour who often use the reverse forehand. Instead of using a traditional volley or overhead smash, she prefers to hit a powerful "swinging" volley when approaching the net or attacking lobs. Sharapova is thought to have good speed around the court, especially considering her height. At the beginning of 2008, some observers noted that Sharapova had developed her game, showing improved movement and footwork and the addition of a drop shot and sliced backhand to her repertoire of shots. Despite her powerful game, Sharapova's greatest asset is considered to be her mental toughness and competitive spirit, with Nick Bollettieri stating that she is "tough as nails". Hall-of-famer John McEnroe said of Sharapova, "she's one of the best competitors in the history of the sport." Sharapova is known for on-court "grunting", which reached a recorded 101 decibels during a match at Wimbledon in 2005. During her second round match in Birmingham in 2003, Sharapova was asked to tone down the level of her grunt after opponent Nathalie Dechy complained to the umpire, with Sharapova's response saying that her grunting was "a natural instinct." Monica Seles suggested that grunting is involuntary and a part of tennis. When questioned by the media about her grunting, Sharapova urged the media to "just watch the match." Her defensive game has been worked on by her new coach, and this has reflected in her results, making consecutive semi-finals at premier mandatory events on the tour. Later in her career, Sharapova also added drop shots to her repertoire, making for a more unpredictable game style. Sharapova at The Championships, Wimbledon in 2009. Early in her career, Sharapova's first and second serves were regarded as powerful, and she was believed to possess one of the best deliveries on the Tour. Since the beginning of 2007, however, problems with her shoulder have reduced the effectiveness of her serve. The shoulder injury resulted in not only her inconsistent first serves, but also her hitting high numbers of double faults. Two-time US Open singles champion Tracy Austin believes that Sharapova often loses confidence in the rest of her game when she experiences problems with her serve and consequently produces more unforced errors and generally plays more tentatively, while tennis writer Joel Drucker remarked that her serve was the "catalyst for her entire game", and that her struggles with it left her "unmasked." In her return from layoff in 2008 to 2009, she used an abbreviated motion, which was somewhat less powerful, and though producing aces, also gave a very high number of double faults. After her early loss at the 2009 US Open, Sharapova returned to a more elongated motion, similar to her pre-surgery serve. She has since been able to produce speeds greater than before, including a 121-mph serve hit at the Birmingham tournament in 2010 – the fastest serve of her career. However, since her shoulder operation Sharapova has been unable to control her serve. This has led to numerous faults, as she is unable to feel how much power she is generating. The new action led to an elbow injury, but under Thomas Högstedt it has improved but can still be erratic. This improvement in serving can be seen in the 2013 Australian Open and following tournaments where Maria Sharapova committed fewer double faults than in previous years. Because she predicates her game on power, Sharapova's preferred surfaces early in her career were the fast-playing hard and grass courts, as evident through her 25 victories on hard court and grass court. This was most notable when she won the 2004 Wimbledon, 2006 U.S. Open and 2008 Australian Open crowns, where she had her career breakthrough and played her peak tennis level, respectively. Sharapova initially was not as well-suited to the slower clay courts as she is on hard and grass courts. Sharapova admitted in 2007 that she was not as comfortable with her movement on clay compared with other court surfaces and once described herself as like a "cow on ice" after a match on clay, due to her inability to slide. Later in her career, she showed improvement on this surface with respect to experience, as evidenced with her first WTA red-clay title at the 2010 Internationaux de Strasbourg, 7 years since playing on the WTA circuit. She won her first French Open title and captured the career grand slam at the 2012 French Open and as of 2014, led the WTA tour of active players with the highest winning percentage on clay, with an 84.25% winning rate. Since her shoulder injury, her best surface has become clay over grass & hard courts, and with her victory at the 2014 French Open, she has now won the French Open twice, which is more times than she has won any other slam, and three out of her four last Grand Slam Finals have all been at the French Open (3 consecutive finals from 2012–2014). Sharapova has had multiple coaches throughout her career including: Robert Lansdorp, Yuri Sharapov, Michael Joyce from 2004–11, Jimmy Connors in 2013, and Sven Groeneveld 2013–2018. Thomas Högstedt from 2011–13, 2018–present  Sharapova and Thomas Högstedt have resumed working together ahead of the 2018 WTA Tour clay court season. In 2011, Sharapov was engaged to Slovenian professional basketball player Sasha Vujačić, with whom she had been in a relationship since 2009. On August 31, 2012, Sharapova confirmed that the pair had ended the engagement and separated earlier that year. Sharapova has lived in the United States since moving there at the age of seven. Besides a home in Bradenton, Florida, she also has a residence in Manhattan Beach, California. From 2005 to 2011, Sharapova was named to the Forbes Celebrity 100, which attempts to compile the top 100 most powerful celebrities of that year. Sharapova has made varying remarks on how long she intends to maintain her tennis career. Following the retirement of 25-year-old Justine Henin in 2008, Sharapova said, "If I [were] 25, and I'd won so many Grand Slams, I'd quit too." In an interview after the 2008 Australian Open, she balked at the idea of playing for another ten years, saying that she hoped to have a "nice husband and a few kids" by then. However, in an interview before her 2012 Australian Open semifinal, Sharapova changed her stance, saying she intended to continue playing tennis for as long as she enjoyed playing the game. Sharapova stated, "I'm sure when I was 17 years old and someone said, you'll be playing for another eight years, it would be like, you're not going to see me at a press conference at 25 years old. But years go on. I missed a year in my career—I didn't play that year. I've said this, just before the tournament, a few weeks before, I woke up, and I was just so happy to be going back on the court. I felt so fresh, full of energy, just with a really good perspective. Times change, obviously. I see myself playing this sport for many more years because it's something that gives me the most pleasure in my life. I think it helps when you know you're good at something, and you can always improve it. It obviously helps with the encouragement." Although a United States resident since 1994, Sharapova still prefers Russian citizenship. The reason she prefers to keep Russian citizenship is because "it is about the family environment, it is about the rich culture. Just life experiences that I look back to and I know that for so many years I was shaped into the individual I was from those experiences. And not necessarily simply the country, but the people, the mentality and the toughness and that never giving up attitude". The Maria Sharapova Foundation is committed to helping children around the world achieve their dreams. Sharapova has donated $100,000 to Chernobyl-related projects. In partnership with the UNDP, she launched a $210,000 scholarship program for students from Chernobyl-affected areas of Belarus that will award five-year scholarships to 12 students at the Belarusian State Academy of Arts and the Belarusian State University. At the 2004 US Open, Sharapova, along with several other Russian female tennis players, wore a black ribbon in observance of the tragedy after the Beslan school hostage crisis, which took place only days before. In 2005, she donated around US$50,000 to those affected by the crisis. On February 14, 2007, Sharapova was appointed a Goodwill Ambassador for the United Nations Development Programme (UNDP) and donated US$210,000 to UNDP Chernobyl-recovery projects. She stated at the time that she was planning to travel back to the area after Wimbledon in 2008, though it didn't happen since she had to travel back to the US because of her shoulder injury. She fulfilled the trip in late June/early July 2010. Sharapova has helped to promote the 2014 Winter Olympics in Sochi, Russia, and was the first torch bearer in the torch-lighting ceremony during the opening festivities. In addition, with Angela Haynes, Maria Kirilenko, Nicole Vaidišová, Rennae Stubbs, Governor Jeb Bush, and Jennifer Capriati, Sharapova participated in an exhibition in Tampa in December 2004, raising money for the Florida Hurricane Relief Fund. In July 2008, Sharapova sent a message on DVD to the memorial service of cancer victim Emily Bailes, who had performed the coin toss ahead of the 2004 Wimbledon final that Sharapova had gone on to win. Sharapova's autobiography, Unstoppable: My Life So Far was published on September 12, 2017, by Sarah Crichton Books. Sharapova's tennis success and appearance have enabled her to secure commercial endorsements that greatly exceed the value of her tournament winnings. In March 2006, Forbes magazine listed her as the highest-paid female athlete in the world, with annual earnings of over US$18 million, the majority of which was from endorsements and sponsorships. She topped that list every year until 2016, even after her 2007 shoulder injury. In 2011, Forbes listed Sharapova as No. 29 in their list of 50 top-paid athletes, the only woman on the list. In 2012, she was listed as No. 15, and was joined in the top 20 by Li Na at No. 16 and Serena Williams at No. 17. In April 2005, People named her one of the 50 most beautiful celebrities in the world. In 2006, Maxim ranked Sharapova the hottest athlete in the world for the fourth consecutive year. She posed in a six-page bikini photoshoot spread in the 2006 Valentine's Day issue of the Sports Illustrated Swimsuit Issue, alongside 25 supermodels. In a poll run by Britain's FHM magazine, she was voted the seventh most eligible bachelorette, based on both "wealth and looks." Immediately after her win at the 2004 Wimbledon Championship, mobile phone company Motorola signed Sharapova to endorse their mobile phone line. Additionally, she appeared in commercials for Land Rover and Canon, as well as approved of namesake items by watch brand Tag Heuer and jeweller Tiffany. Tiffany also provides Sharapova with earrings from the "Tiffany for Maria Sharapova" collection at the four major events, that are also retailed globally. She also starred in an award-winning campaign for the sports clothing brand Nike, "Pretty", in the summer of 2006. She signed a sponsorship deal in January 2007 with Gatorade and Tropicana, which ended in 2009. In 2007, Sharapova was featured in a number of Canon USA's commercials for the PowerShot. Sharapova has also been depicted in many tennis-related video games. Some of the titles include the Top Spin series, Virtua Tennis series, and Grand Slam Tennis series. During the layoff due to her shoulder surgery, sensing the fleeting nature of a professional athlete's career, Sharapova decided to focus on developing her name as a brand, beginning with meeting with her sponsors more extensively to further her brand. In January 2010, it was announced that Sharapova had renewed her contract with Nike, signing an 8-year deal for $70 million. This is the most lucrative deal ever for a sportswoman, dwarfing the previous record, which was Venus Williams' $43 million deal with Reebok. Following in the footsteps of tennis players who started clothing lines such as Fred Perry and René Lacoste, Sharapova launched her own tennis apparel line, the "Nike Maria Sharapova Collection", in 2010. The collection includes dresses that she designed for all the major tournaments, in collaboration with Nike and Cole Haan. She had previously found that the outfits given to her by Nike did not suit her frame and were worn by too many other players. She comes up with design ideas and sketches in a process that begins 18 months before the event and receives royalties from the sale of the collection, of which the corresponding dresses are coordinated to be available simultaneously with the corresponding major tournament. The collection is worn by other WTA players, including Sofia Arvidsson, Eugenie Bouchard, Kai-Chen Chang, Andrea Hlaváčková, Madison Keys, Anastasia Pivovarova as well as junior players such as Indy de Vroome. Sharapova had earlier collaborated with Nike on the "little black dress" that she wore for her night matches at the 2006 US Open. The dress featured a round crystal studded collar and was inspired by Audrey Hepburn. The dress was well publicized and received but was not mass-produced. Additionally, she designs shoes and handbags for Cole Haan, for which her signature ballerina flats are one of the biggest sellers of the entire brand. Sharapova used the Prince Triple Threat Hornet for part of 2003 and then used several different Prince racquets until the US Open. She gave the racquet she used in the 2004 Wimbledon final to Regis Philbin when taping Live with Regis and Kelly. Sharapova began using the Prince Shark OS at that tournament specially designed for her. She then switched to the Prince O3 White racquet in January 2006. She switched to the Prince O3 Speedport Black in July 2008. After being with Prince for ten years, Sharapova began endorsing Head racquets in 2011 and uses the Head YOUTEK IG Instinct. Sharapova signed a three-year deal to be brand ambassador for Porsche in 2013. Sugarpova is a candy line created by Maria Sharapova and candy veteran Jeff Rubin, founder of international retailer IT'SUGAR. According to the Sugarpova website, "Sugarpova is a premium candy line that reflects the fun, fashionable, sweet side of international tennis sensation Maria Sharapova." A portion of all proceeds goes to the Maria Sharapova Foundation, Sharapova's charity. Sugarpova was launched worldwide in 2013. In February 2016, Sugarpova announced that it had partnered with Polish company Baron Chocolatier to make Sugarpova Premium Chocolates. Sugarpova also plans to extend its range to lifestyle products. Note: At the 2003 Australian Open and 2003 French Open, Sharapova won three qualifying round matches at each tournament in order to enter the main draw. Note 3: At the 2018 French Open, Sharapova's encounter in the fourth round did not count as win because she received walkover to the next round. "Players: Maria Sharapova". WTA. Retrieved April 19, 2013. ^ a b c d e f g h i j k l "Maria Sharapova". WTA. Retrieved September 1, 2015. ^ Simon Briggs (August 28, 2013). "US Open 2011: Elena Baltacha warns Heather Watson of the extreme intensity of Maria Sharapova". The Telegraph. Retrieved May 4, 2013. ^ "Notes& Netcords" (PDF). WTA. July 16, 2012. Archived from the original (PDF) on January 6, 2014. Retrieved May 19, 2013. ^ "Maria Sharapova reclaims world number one ranking". 3News. MediaWorks TV. June 8, 2012. Retrieved May 4, 2013. ^ "McEnroe Insights: Maria Sharapova". 3News. YouTube. January 26, 2011. Retrieved January 11, 2015. ^ William Lee Adams (June 22, 2011). "30 Legends of Women's Tennis: Past, Present and Future – Maria Sharapova". Time. Retrieved August 19, 2011. ^ "The World's Highest-Paid Female Athletes 2015". Forbes. Retrieved August 12, 2015. ^ Kurt Badenhausen. "How Maria Sharapova Earned $285 Million During Her Tennis Career". Forbes. Retrieved March 8, 2016. ^ "Maria Sharapova failed drugs test at Australian Open". BBC. March 8, 2016. ^ "Press release: Tennis Anti-Doping Programme statement regarding Maria Sharapova". International Tennis Federation. March 7, 2016. Retrieved March 15, 2016. ^ "Maria Sharapova banned for two years for failed drugs test but will appeal". BBC. June 8, 2016. ^ a b "CAS Reduce Sharapova Suspension to 15 Months". WTATennis.com. Retrieved October 4, 2016. ^ a b "Maria Sharapova's drugs ban cut to 15 months on appeal". CCN. Retrieved October 4, 2016. ^ "Everything you need to know about Maria Sharapova's appeal, what the CAS found, and when the former No. 1 can return to the tour". Wtatennis.com. Retrieved October 4, 2016. ^ Rossingh, Danielle. "Maria Sharapova To Mentor Women Business Owners". Forbes. Retrieved March 11, 2018. ^ a b Шарапова, Мария [Sharapova, Maria] (in Russian). Lenta.ru. Retrieved April 29, 2013. ^ a b c Paul Kimmage (January 13, 2008). "The Big Interview: Maria Sharapova". The Times. London. Retrieved July 23, 2008. ^ a b c Will Stewart (July 2, 2004). "'Masha' was a star at four". London Evening Standard. UK. Archived from the original on July 7, 2011. Retrieved June 12, 2010. ^ "Eddie Herr Past Champions". Eddie Herr Official Website. Archived from the original on July 25, 2012. Retrieved June 12, 2010. ^ "Eddie Herr International Special Awards" (PDF). Eddie Herr Official Website. Archived from the original (PDF) on March 17, 2012. Retrieved June 12, 2010. ^ Nick Collins (June 24, 2009). "Wimbledon 2009: Maria Sharapova – 20 facts you didn't know". The Daily Telegraph. Retrieved July 19, 2010. ^ Liz Schroeder (November 10, 2003). "WTA Tour Singles Ranking 2003" (PDF). WTA. Archived from the original (PDF) on September 28, 2017. Retrieved June 12, 2010. ^ "Sharapova dismisses Dokic". BBC. June 28, 2003. Retrieved May 12, 2013. ^ "Sharapova handed Bell Challenge title". USA Today Co. November 2, 2003. Retrieved May 12, 2013. ^ "WTA Awards". Archived from the original on May 17, 2013. Retrieved May 18, 2013. ^ "Myskina downs Sharapova in Russian clash". Sports Illustrated. January 24, 2004. Archived from the original on June 16, 2013. Retrieved May 29, 2013. ^ "Federer upset in Rotterdam; Roddick falls at Kroger". USA Today. February 20, 2004. Retrieved May 29, 2013. ^ "Suarez strikes another blow for Argentina". The Age. June 2, 2004. Retrieved June 8, 2013. ^ Liz Clarke (April 7, 2004). "Sharapova Wins Wimbledon After Improbable Journey". The Washington Post. Retrieved June 20, 2010. ^ Adrian Warner (February 7, 2004). "Birth of a superstar". This Is London. Archived from the original on September 12, 2012. Retrieved June 20, 2010. ^ "Sharapova vaults into top 10". ESPN. July 6, 2004. Retrieved May 19, 2013. ^ Chris Isidore (August 30, 2004). "Maria Mania: no stopping her now". CNN. Retrieved June 20, 2010. ^ "Pierce shocks Sharapova". BBC. September 4, 2004. Retrieved June 8, 2013. ^ "Molik stuns Sharapova in Zurich final". The Age. October 25, 2004. Retrieved June 8, 2013. ^ "Sharapova wins season's finale". BBC. November 16, 2004. Retrieved June 8, 2013. ^ "Sharapova humiliated by Davenport". BBC. March 18, 2005. Retrieved August 7, 2011. ^ Sandra Harwitt (April 1, 2005). "Sharapova Rights Her Game vs. Venus Williams". The New York Times. Retrieved June 8, 2013. ^ Amy Shipley (April 3, 2005). "Clijsters's Dream Continues". The Washington Post. Retrieved June 8, 2013. ^ "Sharapova edges nearer to summit". BBC. May 13, 2005. Retrieved August 7, 2011. ^ Stephen Bierley (June 1, 2005). "Henin reduces Sharapova to dust". The Guardian. Retrieved June 8, 2013. ^ "Sharapova keeps Birmingham title". BBC. June 12, 2005. Retrieved June 8, 2013. ^ "Williams ends Sharapova's defence". BBC. June 30, 2005. Retrieved June 8, 2013. ^ a b c d e f g h "Q&A: Sharapova's First Business Aims for the Sweet Spot". The Moscow Times. April 26, 2013. Retrieved May 4, 2013. ^ "Clijsters battles past Sharapova". BBC. September 9, 2005. Retrieved June 8, 2013. ^ "Davenport regains No. 1 ranking". NDTV. August 27, 2005. Retrieved June 8, 2013. ^ "Sharapova, Henin-Hardenne advance to Open final". ESPN. September 8, 2006. Retrieved June 9, 2013. ^ "Sharapova into all-Russian final". BBC. March 18, 2006. Retrieved June 9, 2013. ^ "Sharapova wins Pacific Life". Chicago Tribune. March 19, 2006. Retrieved June 9, 2013. ^ "Kuznetsova quiets Sharapova scream on the way to title". The Guardian. April 2, 2006. Retrieved June 9, 2013. ^ "Sharapova Falls at French Open". The New York Times. June 4, 2006. Retrieved June 9, 2013. ^ "Sharapova suffers surprise defeat". BBC. June 17, 2006. Retrieved June 9, 2013. ^ "Mauresmo survives lapse to reach Wimbledon final". ABC. July 7, 2006. Retrieved June 9, 2013. ^ "Sharapova outlasts Clijsters in Acura final". USA Today. August 6, 2006. Retrieved May 31, 2013. ^ "Sharapova stops No. 1 Mauresmo, will meet Henin-Hardenne in U.S. Open final". USA Today. September 8, 2006. Retrieved May 31, 2013. ^ "Sharapova drops Henin-Hardenne to win U.S. Open title". ESPN. September 12, 2006. Retrieved May 31, 2013. ^ "Henin-Hardenne came up aces". Sun Sentinel. November 26, 2006. Retrieved June 9, 2013. ^ "Leg injury forces Sharapova out". BBC. February 3, 2007. Retrieved June 2, 2013. ^ "Sharapova sets up Venus showdown in rainy Miami". Reuters. March 27, 2007. Retrieved June 9, 2013. ^ Verdell A. Wright (March 27, 2007). "Serena Williams Defeats Maria Sharapova Today in Key Biscayne". Yahoo. Archived from the original on July 29, 2014. Retrieved June 9, 2013. ^ "Sharapova battles to Istanbul win". BBC. May 24, 2007. Retrieved May 22, 2013. ^ "Ivanovic stuns Sharapova to set up Henin showdown". The Guardian. June 7, 2007. Retrieved May 22, 2013. ^ "Jankovic seals win over Sharapova". BBC. June 17, 2007. Retrieved June 9, 2013. ^ "Henin sends Serena crashing out". The Guardian. July 4, 2007. Retrieved June 9, 2013. ^ "Sharapova loses to teen Radwanska". BBC. September 1, 2007. Retrieved July 23, 2008. ^ "Sharapova crashes out in Moscow". BBC. October 10, 2007. Retrieved June 9, 2013. ^ Richard Evans (November 11, 2007). "Sharapova straight in". Retrieved June 9, 2013. ^ Joel Drucker (December 13, 2007). "Strong finish for Sharapova; stronger return by Davenport". ESPN. Retrieved June 9, 2013. ^ "Brilliant Sharapova hammers Henin". BBC. January 22, 2008. Retrieved August 7, 2011. ^ Clarey, Christopher (January 24, 2008). "Sharapova Reaches the Final Again and Hopes for a Better Outcome". The New York Times. Retrieved August 7, 2011. ^ "Sharapova wins epic battle". BBC. April 11, 2008. Retrieved May 4, 2013. ^ "Tennis: Serena Williams beats Maria Sharapova 4th time in a row". The Seattle Times. April 19, 2008. Archived from the original on September 8, 2014. Retrieved May 4, 2013. ^ "Sharapova to take over top ranking from retired Henin". ESPN. May 15, 2008. Retrieved May 4, 2013. ^ "Sharapova needs 8–6 win in third set to overcome Rodina". ESPN. May 28, 2008. Retrieved May 4, 2013. ^ "Sharapova a long way from Grand Slam form". Fox News Channel. May 28, 2008. Archived from the original on February 15, 2009. Retrieved August 7, 2011. ^ Clarey, Christopher (June 3, 2008). "Sharapova Roars, but She Is Silenced by Safina Once Again". The New York Times. Retrieved August 7, 2011. ^ "Sharapova to drop from top spot after French Open". ESPN. June 3, 2008. Retrieved August 7, 2011. ^ "Sharapova loss just the start of a chaotic day at Wimbledon". ESPN. June 27, 2008. Retrieved August 7, 2011. ^ "Sharapova withdraws from Rogers Cup". CBC. July 31, 2008. Retrieved May 4, 2013. ^ "Sharapova to miss US Open & Games". BBC. August 1, 2008. Retrieved May 4, 2013. ^ Christine Brennan (June 30, 2011). "Sharapova back at last where she belongs". USA Today. Retrieved May 4, 2013. ^ Linda Pearce (January 12, 2009). "Sharapova out after shoulder fails to recover". The Age. Fairfax Digital. Retrieved May 4, 2013. ^ "Bondarenko wins in straight sets". ESPN. May 21, 2009. Retrieved June 9, 2013. ^ Mark Hodgkinson (June 2, 2009). "French Open 2009: Maria Sharapova and the curse of the cover stars". The Daily Telegraph. Retrieved June 9, 2013. ^ "Sharapova broken six times in loss". ESPN. June 13, 2009. Retrieved June 9, 2013. ^ Hodgkinson, Mark (June 24, 2009). "Wimbledon 2009: Maria Sharapova suffers shock defeat by Gisela Dulko". The Daily Telegraph. Retrieved May 18, 2013. ^ "Oudin's run continues; Safina exits early". ESPN. September 6, 2009. Retrieved June 9, 2013. ^ "Sharapova lands Tokyo title as Jankovic quits". CNN. October 3, 2009. Retrieved June 9, 2013. ^ "Tired Maria Sharapova knocked out of China Open by Peng Shuai". The Guardian. October 7, 2009. Retrieved June 9, 2013. ^ Mark Hodgkinson (January 18, 2010). "Australian Open 2010: Maria Sharapova dumped out by Maria Kirilenko". The Telegraph. London. Retrieved June 12, 2010. ^ "Maria Sharapova beats Sofia Arvidsson in Memphis final". BBC Sport. January 21, 2010. Retrieved February 22, 2010. ^ "Sharapova suffers fresh setback after elbow injury". CNN. March 18, 2010. Retrieved June 12, 2010. ^ "Serena Williams, Sharapova withdraw from Family Circle Cup". United States Tennis Association. April 9, 2010. Archived from the original on April 13, 2010. Retrieved June 12, 2010. ^ "Sharapova wins second 2010 title at Strasbourg". The China Post. Taiwan (ROC). May 24, 2010. Archived from the original on September 25, 2012. Retrieved June 12, 2010. ^ "French Open 2010: Justine Henin defeats Maria Sharapova". The Telegraph. May 30, 2010. Retrieved June 14, 2013. ^ "Sharapova tests Serena". Sky Sports. June 29, 2010. Archived from the original on July 1, 2010. Retrieved July 3, 2010. ^ Chris McGrath (June 29, 2010). "Serena forced into top gear to tame Sharapova". The Independent. UK. Retrieved July 3, 2010. ^ John Martin (June 28, 2010). "Serena Williams Avoids Flashback, Beats Sharapova". The New York Times. Retrieved July 3, 2010. ^ "Azarenka rolls past Sharapova to win Bank of the West title". USA Today. February 8, 2010. Retrieved June 14, 2013. ^ "Clijsters Storms Back to Win 2010 Women's Open". WTA. Retrieved June 14, 2013. ^ "Maria Sharapova loses in 4th round". ESPN. September 7, 2010. Retrieved June 14, 2013. ^ "Japan's Date Krumm ousts Sharapova at Pan Pacific Open". USA Today. September 29, 2010. Retrieved May 4, 2013. ^ "Tired Maria Sharapova knocked out of China Open by Peng Shuai". The Guardian. October 7, 2010. Retrieved May 4, 2013. ^ "2010: Year-End Top 20". WTA. November 10, 2010. Retrieved May 4, 2013. ^ Matthew Cronin (December 4, 2010). "Sharapova hires Hogstedt to co-coach with Joyce". TENNIS.com. Retrieved October 23, 2014. ^ "Maria & Vera In Monterrey". WTA. December 7, 2010. Archived from the original on June 15, 2013. Retrieved May 4, 2013. ^ "Sharapova's long-time coach leaves job". RIA Novosti. January 16, 2011. Retrieved October 23, 2014. ^ Anton Denisov (January 23, 2011). "Russia's Sharapova loses out to Germany's Petkovic in Australian Open". Retrieved July 5, 2011. ^ Ravi Ubha (February 16, 2011). "Work to do for Roddick and the Americans". ESPN. Retrieved May 4, 2013. ^ Beth Harris (March 20, 2011). "Wozniacki Wins BNP Paribas Open, Beats Marion Bartoli In Finals". The Huffington Post. Archived from the original on March 23, 2011. Retrieved June 14, 2013. ^ "Russia's Sharapova moves into semis at Miami tennis tournament". RIA Novosti. March 30, 2011. Retrieved June 14, 2013. ^ "Victoria Azarenka routs Sharapova". ESPN. January 29, 2011. Retrieved June 14, 2013. ^ "Sharapova's Greatest Clay Court Triumph". WTA. May 15, 2011. Retrieved May 4, 2013. ^ Louisa Baker (June 2, 2011). "Li sweeps Sharapova aside for tilt at title". Archived from the original on March 22, 2012. Retrieved June 4, 2011. ^ Piers Newbery (July 2, 2011). "Wimbledon 2011: Petra Kvitova beats Maria Sharapova to title". BBC. Retrieved May 4, 2013. ^ "Serena Shines In QFs, Lisicki Awaits In SFs". WTA. July 29, 2011. Retrieved May 4, 2013. ^ "Stosur Dismisses Li, Tough Day For Faves". WTA. August 11, 2011. Retrieved May 4, 2013. ^ "Bartoli Back On Track, Serena Edges Hradecka". WTA. August 16, 2011. Retrieved May 4, 2013. ^ "Hantuchova Gets Past Bartoli, Zvonareva Next". WTA. August 18, 2011. Retrieved May 4, 2013. ^ "Zvonareva & Sharapova to clash in semifinals". WTA. August 19, 2011. Retrieved May 4, 2013. ^ "Former world No. 1s to Collide in Cincinnati". WTA. August 20, 2011. Retrieved May 4, 2013. ^ Shannon Russell (August 22, 2011). "Sharapova wins women's title". Cincinnati.com. Archived from the original on April 7, 2013. Retrieved May 4, 2013. ^ "Ranking Watch: Maria Moves Up To No. 4". WTA. August 22, 2011. Retrieved May 4, 2013. ^ "Maria Sharapova Shocked Out of US Open, More From New York". Tennisnow. September 2, 2011. Retrieved September 2, 2011. ^ Rob Smaal (September 30, 2011). "Sharapova limps out of Pan Pacific Open". The Asahi Shimbun Company. Archived from the original on February 21, 2014. Retrieved June 2, 2013. ^ "Ankle injury forces Sharapova to retire in Tokyo QF against Kvitova". RIA Novosti. September 29, 2011. Retrieved May 4, 2013. ^ Musall, Jeff (April 20, 2011). "Maria Sharapova Withdraws from Brisbane, Still on for Australian Open: Fan Reaction – Tennis – Yahoo! Sports". Sports.yahoo.com. Archived from the original on January 11, 2012. Retrieved January 25, 2012. ^ Greg Heakes (May 17, 2012). "Ivanovic sweats on extent of hip injury". Google. Archived from the original on June 15, 2013. Retrieved June 2, 2013. ^ "Sharapova, Serena reach Madrid Open quarters". Fox News. May 10, 2012. Retrieved June 2, 2013. ^ "Maria Sharapova". BBC. May 20, 2013. Retrieved May 21, 2012. ^ "Sharapova savours her 'sweetest triumph' as reward for comeback". The Independent. June 11, 2012. Retrieved June 11, 2012. ^ Reid Cherner (June 14, 2012). "Maria Sharapova to carry Russian flag in opening ceremony". CBS Sports. Retrieved May 4, 2013. ^ "Serena, Maria Sharapova in final". ESPN. August 3, 2012. Retrieved May 4, 2013. ^ "London 2012 Olympics: Serena Williams storms to gold medal as she thrashes Maria Sharapova in women's final". Retrieved August 4, 2012. ^ Diane Pucin (August 27, 2012). "Maria Sharapova isn't pregnant, denies Istanbul wedding rumor". Los Angeles Times. Retrieved May 4, 2013. ^ Jane McManus (September 6, 2012). "Maria Sharapova reigns after rain". ESPN. Archived from the original on September 7, 2012. Retrieved June 2, 2013. ^ "Sharapova and Azarenka out in Tokyo". ESPN. September 27, 2012. Retrieved June 2, 2013. ^ "Azarenka overwhelms Sharapova to win China Open". China Central Television. October 8, 2012. Retrieved June 2, 2013. ^ "Scores". WTA. Archived from the original on August 10, 2013. Retrieved June 2, 2013. ^ "Maria Sharapova skips Brisbane". ESPN. January 1, 2013. Retrieved March 22, 2013. ^ "Once In A Lifetime For Sharapova". WTA. January 16, 2013. Retrieved May 4, 2013. ^ Martin Baccardax (February 16, 2013). "Qatar Total Open: Williams Blasts Sharapova as New World Number One Rolls into Doha Final". International Business Times. Archived from the original on February 18, 2013. Retrieved May 22, 2013. ^ Martin Baccardax (March 17, 2013). "Maria Sharapova wins Indian Wells". ESPN. Retrieved May 22, 2013. ^ "Maria Sharapova dominates Caroline Wozniacki for second Indian Wells title". SI.com. March 17, 2013. Archived from the original on March 20, 2013. Retrieved March 22, 2013. ^ "Sharapova aims for coast-to-coast double". Ubisporting. March 23, 2013. Archived from the original on June 6, 2014. Retrieved March 22, 2013. ^ "Sharapova sails past Wozniacki in Indian Wells final". Fox News. March 17, 2013. Retrieved March 22, 2013. ^ Joseph Wilson (May 12, 2013). "Serena Williams Beats Maria Sharapova To Win Madrid Open 2013, Retain No. 1 Ranking". The Huffington Post. Archived from the original on June 8, 2013. Retrieved May 22, 2013. ^ Patrick Clarke (May 11, 2013). "Serena Williams vs. Maria Sharapova: World No. 1 Will Dominate Madrid Open Final". Bleacher Report. Retrieved May 22, 2013. ^ "Maria Sharapova beats Li Na to retain Stuttgart title". Retrieved April 28, 2013. ^ "Serena Williams repeats as Madrid Open champion". United Press International. May 12, 2013. Retrieved June 2, 2013. ^ "Djokovic loses at Rome Masters, hurting French Open preparations". CNN. May 18, 2013. Retrieved May 22, 2013. ^ "Serena, Azarenka reach semis; Sharapova pulls out in Rome". Fox News. May 17, 2013. Retrieved May 22, 2013. ^ "Maria Sharapova withdraws from the U.S. Open". USA Today. Retrieved August 22, 2013. ^ "Maria Sharapova to make tennis comeback at Brisbane International". News.com.au. Retrieved November 14, 2013. ^ "Maria Sharapova ousted by Camila Giorgi in third round at Indian Wells | Beyond The Baseline". Tennis.si.com. Archived from the original on March 11, 2014. Retrieved March 11, 2014. ^ "Sharapova wins Madrid Open title". Times of India. Retrieved May 11, 2014. ^ Meyers, Nalia-Jean. "Maria Sharapova Wins French Open". The New York Times. Retrieved June 7, 2014. ^ Maria Sharapova hops on the London Underground Dailymail. June 10, 2014. Retrieved June 11, 2014. ^ "Maria Sharapova To Come Back In Wuhan". Women's Tennis Association. Retrieved January 5, 2016. ^ "Injury Cuts Short Sharapova Comeback". Women's Tennis Association. Retrieved January 5, 2016. ^ "Maria Sharapova Withdraws From Beijing". Women's Tennis Association. Retrieved January 5, 2016. ^ "Halep & Sharapova Out Of Brisbane". Women's Tennis Association. Retrieved January 5, 2016. ^ "Sharapova to Sit out Fed Cup Singles – Tennis Now". www.tennisnow.com. Retrieved February 6, 2016. ^ "Sharapova Out Of Doha". Women's Tennis Association. Retrieved February 27, 2016. ^ "Sharapova Out Of Indian Wells". Women's Tennis Association. Retrieved March 4, 2016. ^ "Press release: Tennis Anti-Doping Programme statement regarding Maria Sharapova". www.itftennis.com. Retrieved March 17, 2016. ^ "Maria Sharapova: Russian banned for two years for failed drugs test". BBC Sport. June 8, 2016. Retrieved June 8, 2016. ^ a b "Sharapova soars past Vinci in Stuttgart opener". WTA. April 26, 2017. Retrieved April 26, 2017. ^ Eccleshare, Charlie; Sport, Telegraph (May 8, 2017). "Eugenie Bouchard stuns Maria Sharapova and claims 'a lot of players had privately wished me good luck'". The Telegraph. ISSN 0307-1235. Retrieved February 21, 2019. ^ "Maria Sharapova: French Open decides against giving former champion a wildcard". BBC Sport. May 17, 2017. Retrieved August 22, 2017. ^ "Siniakova supreme over Sharapova to make second straight Shenzhen final". January 5, 2018. Retrieved January 10, 2018. ^ "Kerber quells Sharapova in battle of former Aussie champs". January 20, 2018. Retrieved January 20, 2018. ^ "Sharapova commits 52 unforced errors in loss to Niculescu in Doha". Tennis.com. Retrieved May 15, 2018. ^ Juzwiak, Jason (March 8, 2018). "Osaka overcomes 'frustrated' Sharapova in Indian Wells". WTA Tennis. Retrieved May 15, 2018. ^ Kane, David (May 6, 2018). "Sharapova snaps losing streak in Madrid, blasts past Buzarnescu". WTA Tennis. Retrieved May 15, 2018. ^ Han, Don (May 8, 2018). "WTA Madrid: Sharapova overcomes huge scare, storms past Begu in straight sets". VAVEL.com. Retrieved May 15, 2018. ^ Livaudais, Stephanie (May 9, 2018). "Sharapova powers to Mladenovic revenge in Madrid". WTA Tennis. Retrieved May 15, 2018. ^ Kane, David (May 10, 2018). "Bertens seals Sharapova in Madrid comeback win". WTA Tennis. Retrieved May 15, 2018. ^ "Maria Sharapova failed drugs test at Australian Open". BBC News Online. March 7, 2016. Retrieved March 7, 2016. ^ "Blood-Flow Drug Meldonium Added to WADA's Banned Substances List". Retrieved March 7, 2016. ^ "Maria Sharapova fails drug test: Her statement in full after admitting testing positive for meldonium". Independent.co.uk. March 7, 2016. ^ a b c "'Sharapova Drug' Is Not Doping, Says Its Latvian Inventor". rferl.org. Retrieved March 14, 2016. ^ "I made a huge mistake". Retrieved March 24, 2016. ^ "When WADA goes rogue: how the anti-doping agency got it wrong". ABC News. Retrieved April 18, 2016. ^ Rachel Axon. "Experts say there's little evidence meldonium enhances performance". USA Today. Retrieved April 5, 2016. ^ "Sponsors back away from Sharapova after failed drug test". Reuters. Retrieved March 8, 2016. ^ "Maria Sharapova drug bombshell: What happens to tennis superstar after positive Meldonium test?". Foxsports (Australia). March 9, 2016. Retrieved March 15, 2016. ^ "Major Changes – 2016 WADA Prohibited List". USADA. Archived from the original on March 19, 2016. Retrieved March 15, 2016. ^ "Maria Sharapova has 'no excuses' for missing five warnings about meldonium ban". stuff.co.nz. March 12, 2016. Retrieved March 11, 2016. ^ "Maria Sharapova denies missing warnings about meldonium". Sydney Morning Herald. March 12, 2016. ^ "Maria Sharapova denies reports she was warned five times over meldonium". The Guardian. Retrieved March 11, 2016. ^ "Tennis world shuns Maria Sharapova". The New Daily Australia. April 5, 2016. Retrieved April 6, 2016. ^ "Tennis: Why no one likes Maria Sharapova". The New Zealand Herald. March 30, 2016. Retrieved March 30, 2016. ^ "McEnroe doesn't believe Sharapova". The Daily Star Bangladesh. March 14, 2016. Retrieved March 26, 2016. ^ "Pat Cash: I find it hard to believe Sharapova". BBC. March 9, 2016. ^ "Maria Sharapova: Jennifer Capriati launches Twitter attack on Russian tennis player after drug test announcement". ABC News (Australia). March 8, 2016. Retrieved March 9, 2016. ^ "Muted response from rivals is because Maria Sharapova has no friends on tour: Evert". Foxsports. March 10, 2016. Retrieved March 27, 2016. Whether it's shock or whether they don't want to become involved or have an opinion about it. It's sort of surprising that not a lot of players have shown their support for her. ^ "Serena Williams Says Sharapova's Announcement Surprised Her". The New York Times. March 8, 2016. Retrieved March 26, 2016. ^ "Nadal: Sharapova should be punished". The New Zealand Herald. March 11, 2016. Retrieved March 12, 2016. ^ "Andy Murray joins Rafael Nadal in calls for Maria Sharapova to face punishment". The National. March 11, 2016. Retrieved March 13, 2016. ^ "'Taking a drug you don't necessarily need because it's legal is wrong' – Andy Murray on Sharapova ban". Irish Independent. March 10, 2016. Retrieved March 26, 2016. ^ "Federer calls for 'zero tolerance' following news of Sharapova's two-year ban". Tennis.com. June 9, 2016. Retrieved June 19, 2016. ^ "Shocked Federer breaks silence on Sharapova doping scandal". The Hans India. March 27, 2016. Retrieved April 6, 2016. ^ "In Tennis, No Tears Are Shed for Maria Sharapova". The Wall Street Journal. March 11, 2016. Retrieved March 29, 2016. ^ "Maria Sharapova provisionally banned from tennis after revealing failed drugs test". The Guardian. March 8, 2016. ^ Zaccardi, Nick. "Maria Sharapova to play Fed Cup, ensure Olympic place; no Tokyo 2020?". OlympicTalk. Retrieved February 7, 2016. ^ "Maria Sharapova: Nike suspends contract with Russian over drugs test". BBC. March 8, 2016. Retrieved March 8, 2016. ^ Gibson, Owen; Cambers, Simon (March 8, 2016). "Maria Sharapova under pressure over meldonium use as sponsors flee". The Guardian. Retrieved March 8, 2016. ^ "Head stand by Maria Sharapova after failed drug test: 'We look forward to working with her'". The National. March 10, 2016. Retrieved March 12, 2016. ^ "Maria Sharapova: Head questions Wada's stance on meldonium". BBC. Retrieved March 11, 2016. ^ "United Nations suspends Maria Sharapova's role as goodwill ambassador". Hindustantimes. March 16, 2016. Retrieved March 16, 2016. ^ "Meldonium: Maria Sharapova faces hearing despite new Wada guidance". BBC News. April 14, 2016. Retrieved April 16, 2016. ^ "Maria Sharapova banned from tennis for two years for positive drug test". FOX Sports. June 8, 2016. Retrieved June 8, 2016. ^ "CAS 2016/A/4643 Maria Sharapova v. International Tennis Federation" (PDF). itftennis.com. Retrieved October 4, 2016. ^ "CAS reduces the ban of Maria Sharapova to fifteen months". tas-cas.org. Retrieved October 4, 2016. ^ "CAS decision in the case of Maria Sharapova". ITFTennis.com. Retrieved October 4, 2016. ^ "Maria Sharapova unwilling to trade her Russian citizenship for anything". Pravda. October 11, 2005. Retrieved May 4, 2013. ^ "Myskina stands by Fed Cup threat". BBC. November 25, 2004. Retrieved May 4, 2013. ^ "Sharapova keen to play for Russia". BBC. October 10, 2005. Retrieved May 4, 2013. ^ "Sharapova delays debut for Russia". BBC. March 8, 2006. Retrieved May 4, 2013. ^ "Sharapova to miss Fed Cup debut". BBC. April 2, 2007. Retrieved May 4, 2013. ^ "Sharapova pull-out angers Russia". BBC. July 10, 2007. Retrieved May 4, 2013. ^ "Russia drop Sharapova for Fed Cup". BBC. July 16, 2007. Retrieved May 4, 2013. ^ "Row over Sharapova's Fed Cup show". BBC. September 17, 2007. Retrieved May 4, 2013. ^ "Sharapova set to make Fed Cup debut". The Age. January 23, 2008. Retrieved May 4, 2013. ^ "Fed Cup: Israel vs. Russia tie". Fed Cup. February 2–3, 2008. Archived from the original on June 30, 2008. Retrieved June 12, 2010. ^ a b "Sharapova set to make Fed Cup debut". The Age. January 23, 2008. Retrieved September 6, 2011. ^ "Sharapova pulls out of Gaz de France due to viral illness". Russia Today. TV-Novosti. February 10, 2011. Archived from the original on June 16, 2013. Retrieved May 4, 2013. ^ "Sharapova to miss Fed Cup semis". Russia Today. TV-Novosti. February 6, 2012. Archived from the original on June 15, 2013. Retrieved May 22, 2013. ^ a b c Jeff Cooper. Maria Sharapova – Tennis Game Profile, About.com. Retrieved July 23, 2008. ^ Steve Bierley. Sharapova adds variety to end Henin run, The Guardian, January 23, 2008. Retrieved July 23, 2008. ^ "Maria Sharapova Scouting report". Thetennistimes.com. Archived from the original on October 7, 2011. Retrieved August 7, 2011. ^ Linda Pearce (July 5, 2004). "Sharapova's arrival a victory for mental toughness". The Age. Melbourne. Retrieved June 12, 2010. ^ Megan Lane (June 22, 2005). "Why do women tennis stars grunt?". BBC. Retrieved July 23, 2008. ^ "Scream queen Sharapova warned to silence screams". June 12, 2003. Retrieved July 4, 2010. ^ Catriona Davies (September 24, 2008). "Grunting is just part of my game, claims Sharapova". The Daily Telegraph. Retrieved October 19, 2008. ^ "Beaten Sharapova turns on media". BBC. January 26, 2006. Retrieved June 2, 2008. ^ a b c Joel Drucker (October 3, 2007). "Lingering injuries or limitations coming to light for Sharapova". ESPN Tennis. Retrieved June 12, 2010. ^ "Bottom line for the top women, 2007", Tennis.com. Retrieved July 23, 2008. ^ Tracy Austin (June 27, 2008). "Austin: Sharapova loss a win for Venus and Serena". NBC Sports. Archived from the original on July 14, 2008. Retrieved July 23, 2008. ^ Mark Hodgkinson (June 21, 2010). "Wimbledon 2010: Maria Sharapova fighting fit at last and ready to reclaim her SW19 crown". The Daily Telegraph. Retrieved June 21, 2010. ^ Pucin, Diane (August 9, 2009). "Maria Sharapova can't control her serve". Los Angeles Times. ^ "Maria Sharapova Serve Analysis – A Look Behind the Sharapova Serve Technique". Optimumtennis.net. Retrieved January 25, 2012. ^ Barry Flatman. Sharapova: a cow on ice?, The Times, May 31, 2007. Retrieved July 23, 2008. ^ "Don't Have a Cow". ^ "Man who put the work into Sharapova". ^ "ESPN: The look of love". ^ "NY Times: Biggest distraction for Sharapova is her father". ^ "Coach Michael Joyce interview". ^ "Maria Sharapova dumps coach Jimmy Connors". ^ "Maria Sharapova hires Sven Groeneveld as her new coach". ^ Nguyen, Courtney. "Maria Sharapova splits with coach". ^ "Maria Sharapova & Sasha Vujacic – Engaged". TMZ. October 21, 2010. Retrieved October 21, 2010. ^ "Maria Sharapova betrothed to guard". ESPN. October 21, 2010. Retrieved October 22, 2010. ^ "The Fabulous Forum: Are Sasha Vujacic and Maria Sharapova dating?". The Los Angeles Times. November 3, 2009. Retrieved June 18, 2010. ^ Kathy Ehrich-Dowd (April 17, 2006). "Celebrity Q & A – Maria Sharapova". People Magazine. Archived from the original on February 23, 2008. ^ "The Celebrity 100". Forbes. Retrieved June 28, 2011. ^ "Henin is best of her generation". BBC. May 15, 2008. Retrieved July 23, 2008. ^ "Billie Jean King's text inspired Sharapova". NBC Sports. Associated Press. January 26, 2008. Archived from the original on June 7, 2008. Retrieved October 24, 2008. ^ O'Brien at, Bren. "Maria not ready for veteran's list – Tennis – Sportal Australia". Sportal.com.au. Archived from the original on September 15, 2012. Retrieved June 11, 2012. ^ www.xperedon.com. "Donate online to Maria Sharapova Foundation". Chnet.com. Retrieved March 29, 2017. ^ David Boroff (September 6, 2004). "Sharapova puts loss in perspective". ESPN. Retrieved May 4, 2013. ^ Beth Harris (August 13, 2007). "Maria Sharapova plans 1st trip back to Chernobyl since family fled". USAToday. Retrieved May 4, 2013. ^ "Interview with Sharapova". WTA. Archived from the original on June 29, 2010. Retrieved May 4, 2013. ^ "Interview with Maria Sharapova". Russia Today. TV-Novosti. May 11, 2007. Retrieved May 4, 2013. ^ "Capriati, Sharapova to play benefit for hurricane victims". CBS Sports. November 10, 2004. Archived from the original on June 15, 2013. Retrieved May 4, 2013. ^ "Service held for Wimbledon girl". BBC. July 4, 2008. Retrieved May 4, 2013. ^ "It does not hurt that Sharapova is regarded as one of the most beautiful athletes in the world." Marketing Maria: Managing the Athlete Endorsement, Harvard Business School Lessons from the classroom, Sara Jane Gilbert, October 29, 2007. Retrieved on June 1, 2008. ^ "The World's Best-Paid Athletes". Forbes. March 22, 2006. ^ "World's Highest-Paid Women Athletes". Retrieved May 9, 2012. ^ "Top-Earning Female Athletes". Forbes. July 22, 2008. ^ "The World's Highest-Paid Athletes". Forbes. August 18, 2010. ^ Kurt Badenhausen (April 18, 2012). "The World's Highest-Paid Athletes". Forbes. Archived from the original on November 6, 2012. Retrieved May 5, 2013. ^ Kurt Badenhausen (June 18, 2012). "Mayweather Tops List Of The World's 100 Highest-Paid Athletes". Forbes. Retrieved May 5, 2013. ^ "PEOPLE's 50 Most Beautiful People". April 27, 2005. Archived from the original on January 4, 2007. Retrieved May 5, 2013. ^ "2006 SWIMSUIT COVER". Sports Illustrated. September 4, 1995. Retrieved May 5, 2013. ^ "Rod's daughter most eligible". News.com.au. February 28, 2007. Archived from the original on March 3, 2007. Retrieved May 4, 2013. ^ a b c d e f g h i Wilson, Eric (May 25, 2011). "Maria Sharapova's Campaign to Establish Herself as a Brand". The New York Times. Retrieved May 5, 2013. ^ "Tiffany & Co. For The Press | News | Maria Sharapova to Wear Tiffany Earrings at the 2011 French Open | United States". Tiffany & Co. May 11, 2011. Archived from the original on January 8, 2013. Retrieved June 11, 2012. ^ "PepsiCo Inks Sharapova To Promote Gatorade, Tropicana Brands". SportsBusiness Journal. January 3, 2007. Retrieved September 10, 2014. ^ Gilmour, Rod (April 16, 2009). "Maria Sharapova loses tennis fizz as Pepsi end deal". The Telegraph. Retrieved September 10, 2014. ^ "Maria Sharapova in Canon PowerShot commercial". LetsGoDigital. Retrieved May 5, 2013. ^ Simon Cambers (January 12, 2010). "Maria Sharapova signs £43m deal with Nike". The Guardian. Retrieved May 5, 2013. ^ a b c d "Grand slam designs: Maria Sharapova's fashion statement". CNN. January 27, 2012. Retrieved May 19, 2013. ^ Carpenter, MacKenzie (September 1, 2006). "Sharapova's little black dress provokes a big racket at U.S. Open". Pittsburgh Post-Gazette. Retrieved May 5, 2013. ^ "Prince Shark Racquet Review". Tennis Warehouse. Archived from the original on March 27, 2008. Retrieved June 18, 2012. ^ "Tennis Racquets, Tennis Footwear, String, EXO3 Racquet". Prince Tennis. Archived from the original on October 22, 2008. Retrieved August 31, 2010. ^ "Gear – Maria Sharapova's New Head for the New Year?". TENNIS.com. December 21, 2010. Archived from the original on December 28, 2010. Retrieved June 11, 2012. ^ "Performance meets Style – Maria Sharapova joins the HEAD team!". Head Tennis. January 3, 2011. Retrieved January 18, 2011. ^ "Maria Sharapova". Tennis Warehouse. January 18, 2011. Retrieved January 18, 2011. ^ Harley, Michael. "Porsche picks Maria Sharapova as brand ambassador". Retrieved August 25, 2013. ^ "International Shipping | Sugarpova". www.sugarpova.com. Retrieved February 3, 2016. ^ "Sugarpova Candy: Sharapova's Sweet Taste of Success". Retrieved January 22, 2013. ^ "Sharapova's Sugarpova lolly range 'smacks of irresponsible marketing'". Retrieved January 22, 2013. ^ a b "About – Sugarpova". www.sugarpova.com. ^ "Baron Chocolatier Chocolates | Premium European Chocolate GMO FREE, NATURAL & KOSHER". baronchocolatier.com. Retrieved February 3, 2016. ^ Cluck, Thomas. "Sugarpova Partners With Baron Chocolatier". VAVEL. Retrieved February 3, 2016. ^ "Sharapova to Extend Sugarpova to Home Goods Sleep and Loungewear". www.tennisworldusa.org. Retrieved February 3, 2016. ^ "WTA Awards". WTA. Archived from the original on April 21, 2013. Retrieved April 29, 2013. ^ a b c d e f g h i j k "Players: Maria Sharapova". WTA. Archived from the original on June 6, 2013. Retrieved April 29, 2013. ^ "Communiqués de presse" [Press releases] (in French). Prix Orange. Archived from the original on November 13, 2008. Retrieved September 6, 2011. ^ "Women's Tennis". Hickock Sports. Archived from the original on February 23, 2002. Retrieved September 6, 2011. ^ Richard Langford (July 12, 2012). "2012 ESPY Awards Winners: Results, Recap and Top Moments". Bleacher Report. Retrieved May 4, 2013. ^ Указ Президента Российской Федерации от April 28, 2012 № 529 "О награждении государственными наградами Российской Федерации" (in Russian). Government of Russia. Archived from the original on May 17, 2012. Retrieved May 5, 2013. ^ Указ Президента Российской Федерации от 13 августа 2012 года № 1165 "О награждении государственными наградами Российской Федерации" (in Russian). Government of Russia. Archived from the original on April 23, 2013. Retrieved May 5, 2013. ^ "Мутко вручил Шараповой государственные награды" [Mutko handed in government awards to Sharapova] (in Russian). Championat.com. February 5, 2016. Retrieved February 5, 2016. Wikimedia Commons has media related to Maria Sharapova.